This manual explains how to use the Modeling Algorithms. It provides basic documentation on modeling algorithms. For advanced information on Modeling Algorithms, see our E-learning & Training offerings. The Modeling Algorithms module brings together a wide range of topological algorithms used in modeling. Along with these tools, you will find the geometric algorithms, which they call. Construct curves and surfaces by interpolation. the intersection between two surfaces. The Geom2dAPI_InterCurveCurve class allows the evaluation of the intersection points (gp_Pnt2d) between two geometric curves (Geom2d_Curve) and the evaluation of the points of self-intersection of a curve. In both cases, the algorithm requires a value for the tolerance (Standard_Real) for the confusion between two points. The default tolerance value used in all constructors is 1.0e-6. The algorithm returns a point in the case of an intersection and a segment in the case of tangent intersection. Geom2dAPI_InterCurveCurve class may be instantiated for intersection of curves C1 and C2. 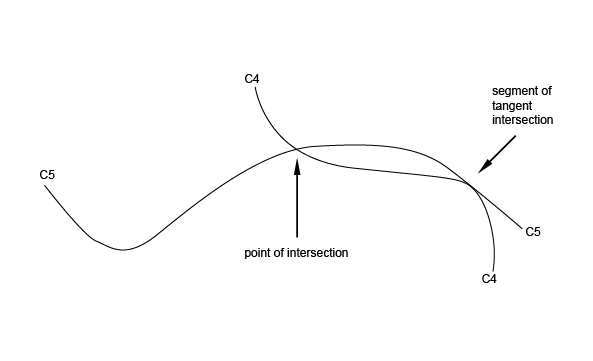 or for self-intersection of curve C3. To select the desired intersection point, pass an integer index value in argument. To select the desired intersection segment pass integer index values in argument. The GeomAPI_IntCS class is used to compute the intersection points between a curve and a surface. Where Index is an integer between 1 and nb, calls the intersection points. The GeomAPI_IntSS class is used to compute the intersection of two surfaces from Geom_Surface with respect to a given tolerance. Once the GeomAPI_IntSS object has been created, it can be interpreted. Calls the number of intersection curves. Where Index is an integer between 1 and nb, calls the intersection curves. The Interpolation Laws component provides definitions of functions: y=f(x) . an interpolation function for a range of values. Such functions can be used to define, for example, the evolution law of a fillet along the edge of a shape. The validity of the function built is never checked: the Law package does not know for what application or to what end the function will be used. In particular, if the function is used as the evolution law of a fillet, it is important that the function is always positive. The user must check this. It is possible to call the BSpline curve from the object defined above it. Note that the Handle(Geom2d_BSplineCurve) operator has been redefined by the method Curve(). Consequently, it is unnecessary to pass via the construction of an intermediate object of the Geom2dAPI_Interpolate type and the following syntax is correct. Note that the Handle(Geom_BSplineCurve) operator has been redefined by the method Curve(). Thus, it is unnecessary to pass via the construction of an intermediate object of the GeomAPI_Interpolate type and the following syntax is correct. Boundary conditions may be imposed with the method Load. 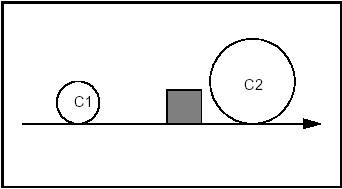 The algorithms for construction of 2D circles or lines can be described with numeric or geometric constraints in relation to other curves. the circle with center in a point or curve. For example, these algorithms enable to easily construct a circle of a given radius, centered on a straight line and tangential to another circle. The implemented algorithms are more complex than those provided by the Direct Constructions component for building 2D circles or lines. This diagram clearly shows that there are 8 possible solutions. In order to limit the number of solutions, we can try to express the relative position of the required solution in relation to the circles to which it is tangential. 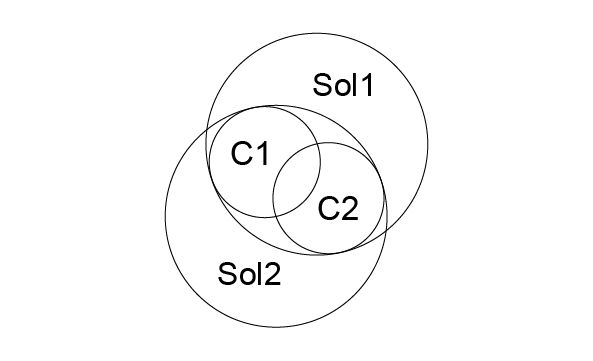 For example, if we specify that the solution is inside the circle C1 and outside the circle C2, only two solutions referenced 3 and 4 on the diagram respond to the problem posed. These definitions are very easy to interpret on a circle, where it is easy to identify the interior and exterior sides. In fact, for any kind of curve the interior is defined as the left-hand side of the curve in relation to its orientation. Unqualified – the relative position is not qualified, i.e. all solutions apply. This expression finds all circles of radius Rad, which are tangent to both circle C1 and C2, while C1 is outside and C2 is inside. line tangent to one element and forming angle with a line. It is not hard to define the interior and exterior of a circle. As is shown in the following diagram, the exterior is indicated by the sense of the binormal, that is to say the right side according to the sense of traversing the circle. The left side is therefore the interior (or "material"). It is sometimes necessary to define in advance the sense of travel along a line to be created. This sense will be from first to second argument. 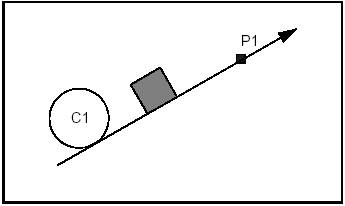 The following figure shows a line, which is first tangent to circle C1 which is interior to the line, and then passes through point P1. The following four diagrams illustrate four cases of using qualifiers in the creation of a line. The fifth shows the solution if no qualifiers are given. Constraints: Tangent and Exterior to C1. Tangent and Exterior to C2. Constraints: Tangent and Including C1. Tangent and Including C2. Constraints: Tangent and Including C1. 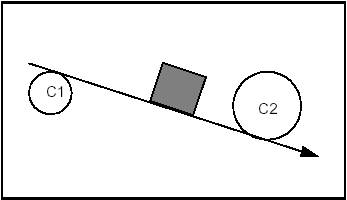 Tangent and Exterior to C2. Constraints: Tangent and Exterior to C1. Tangent and Including C2. Constraints: Tangent and Undefined with respect to C1. Tangent and Undefined with respect to C2. 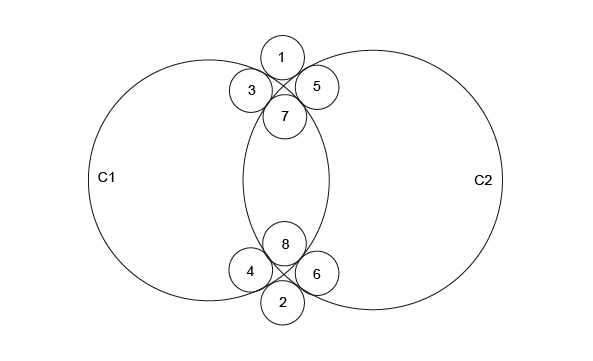 The following four diagrams show the four cases in using qualifiers in the creation of a circle. Constraints: Tangent and Exterior to C1. Tangent and Included by C2. 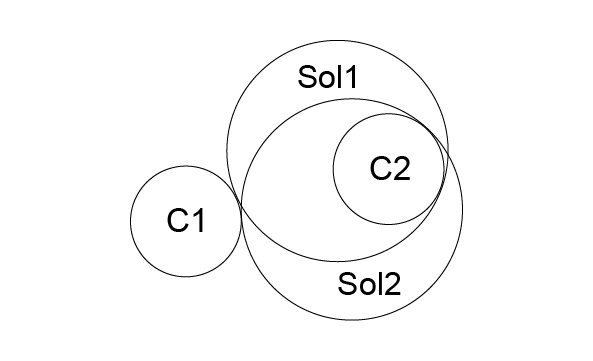 Constraints: Tangent and Enclosing C1. 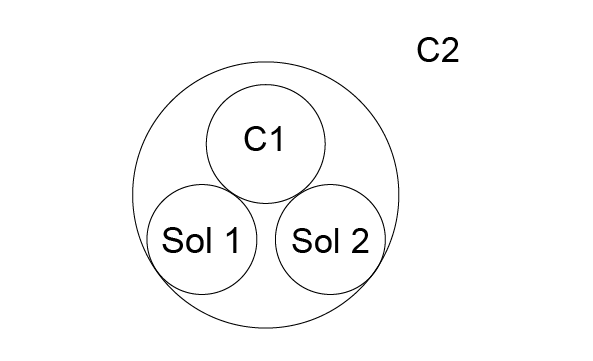 Tangent and Enclosing C2. Iterative algorithms, where the solution is obtained by a process of iteration. algorithms from the package GccAna resolve the problem analytically, and can only be used when the geometries to be worked on are lines or circles; both the used arguments and the computed solutions are gp objects. The provided algorithms compute all solutions, which correspond to the stated geometric problem, unless the solution is found by an iterative algorithm. 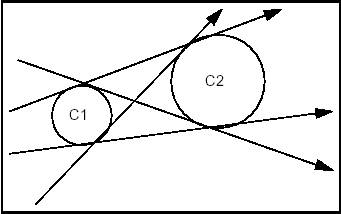 to build a line, when a tangency argument is more complex than a line or a circle. the Geom2dGcc package, for general use by Geom2dGcc algorithms. The GccEnt and Geom2dGcc packages also provide simple functions for building qualified curves in a very efficient way. The GccAna package also provides algorithms for constructing bisecting loci between circles, lines or points. Bisecting loci between two geometric objects are such that each of their points is at the same distance from the two geometric objects. They are typically curves, such as circles, lines or conics for GccAna algorithms. Each elementary solution is given as an elementary bisecting locus object (line, circle, ellipse, hyperbola, parabola), described by the GccInt package. Note: Curves used by GccAna algorithms to define the geometric problem to be solved, are 2D lines or circles from the gp package: they are not explicitly parameterized. However, these lines or circles retain an implicit parameterization, corresponding to that which they induce on equivalent Geom2d objects. This induced parameterization is the one used when returning parameter values on such curves, for instance with the functions Tangency1, Tangency2, Tangency3, Intersection2 and CenterOn3 provided by construction algorithms from the GccAna or Geom2dGcc packages. extension of a 3D curve or surface beyond its original bounds. OPEN CASCADE company also provides a product known as Surfaces from Scattered Points, which allows constructing surfaces from scattered points. This algorithm accepts or constructs an initial B-Spline surface and looks for its deformation (finite elements method) which would satisfy the constraints. Using optimized computation methods, this algorithm is able to construct a surface from more than 500 000 points. SSP product is not supplied with Open CASCADE Technology, but can be purchased separately. Elastic beam curves have their origin in traditional methods of modeling applied in boat-building, where a long thin piece of wood, a lathe, was forced to pass between two sets of nails and in this way, take the form of a curve based on the two points, the directions of the forces applied at those points, and the properties of the wooden lathe itself. Maintaining these constraints requires both longitudinal and transversal forces to be applied to the beam in order to compensate for its internal elasticity. 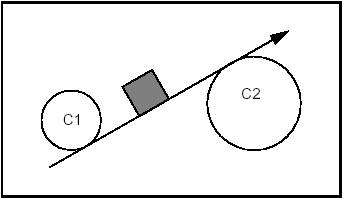 The longitudinal forces can be a push or a pull and the beam may or may not be allowed to slide over these fixed points. 2 the curve must pass through a point, have a given tangent and a given curvature. Only 0 and 1 constraint orders are used. The function Curve returns the result as a 2D BSpline curve. Constraint orders of 0, 1 and 2 can be used. The algorithm minimizes tension, sagging and jerk energy. The function Curve returns the result as a 2D BSpline curve. Free sliding is generally more aesthetically pleasing than constrained sliding. However, the computation can fail with values such as angles greater than p/2 because in this case the length is theoretically infinite. In other cases, when sliding is imposed and the sliding factor is too large, the batten can collapse. The constructor parameters, Tolerance and NbIterations, control how precise the computation is, and how long it will take. A ruled surface is built by ruling a line along the length of two curves. The class GeomFill_BezierCurves allows producing a Bezier surface from contiguous Bezier curves. Note that problems may occur with rational Bezier Curves. 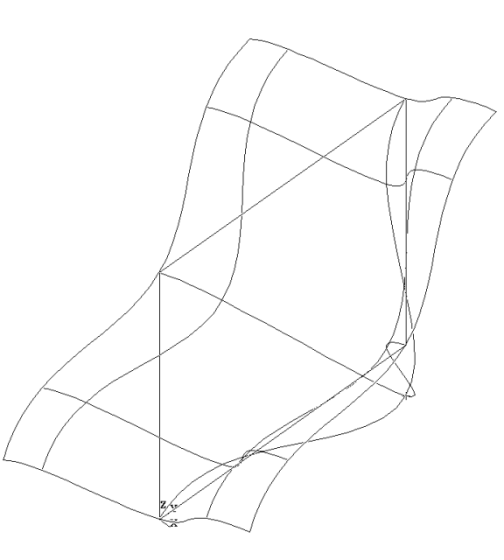 The class GeomFill_BSplineCurves allows producing a BSpline surface from contiguous BSpline curves. Note that problems may occur with rational BSplines. The class GeomFill_Pipe allows producing a pipe by sweeping a curve (the section) along another curve (the path). The result is a BSpline surface. pipes with a section evolving between two given curves. It is often convenient to create a surface from some curves, which will form the boundaries that define the new surface. This is done by the class GeomFill_ConstrainedFilling, which allows filling a contour defined by three or four curves as well as by tangency constraints. The resulting surface is a BSpline. 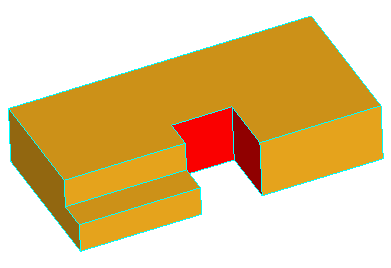 A case in point is the intersection of two fillets at a corner. 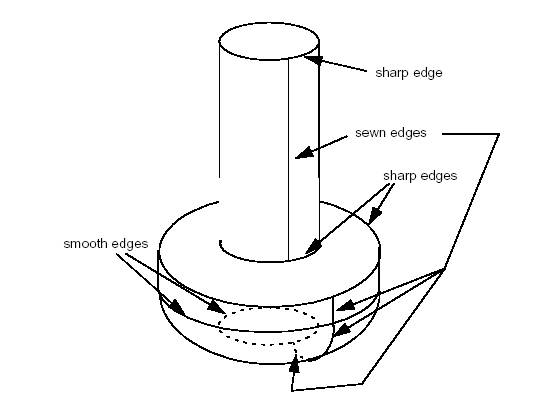 If the radius of the fillet on one edge is different from that of the fillet on another, it becomes impossible to sew together all the edges of the resulting surfaces. This leaves a gap in the overall surface of the object which you are constructing. These algorithms allow you to fill this gap from two, three or four curves. This can be done with or without constraints, and the resulting surface will be either a Bezier or a BSpline surface in one of a range of filling styles. The class GeomFill_SimpleBound allows you defining a boundary for the surface to be constructed. 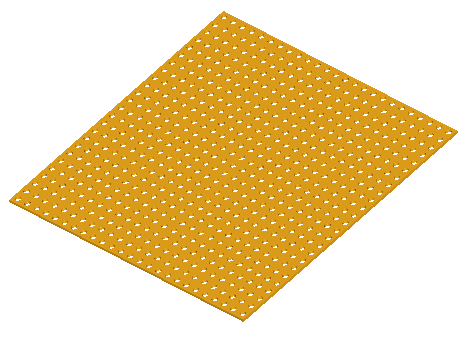 The class GeomFill_BoundWithSurf allows defining a boundary for the surface to be constructed. This boundary will already be joined to another surface. Curved – the style with the most rounded patches. In CAD, it is often necessary to generate a surface which has no exact mathematical definition, but which is defined by respective constraints. These can be of a mathematical, a technical or an aesthetic order. Essentially, a plate surface is constructed by deforming a surface so that it conforms to a given number of curve or point constraints. In the figure below, you can see four segments of the outline of the plane, and a point which have been used as the curve constraints and the point constraint respectively. The resulting surface can be converted into a BSpline surface by using the function MakeApprox . The surface is built using a variational spline algorithm. It uses the principle of deformation of a thin plate by localised mechanical forces. 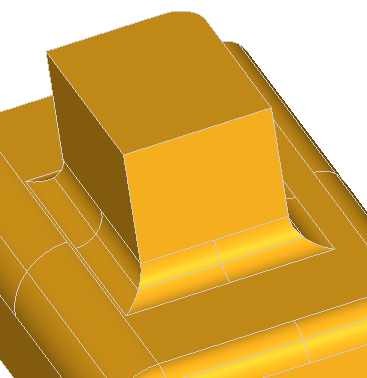 If not already given in the input, an initial surface is calculated. 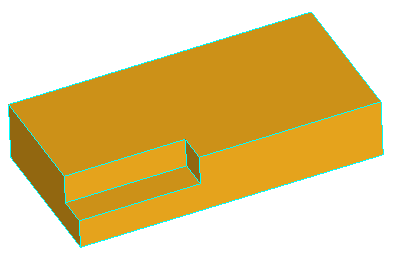 This corresponds to the plate prior to deformation. Then, the algorithm is called to calculate the final surface. It looks for a solution satisfying constraints and minimizing energy input. The class BuildPlateSurface allows creating a framework to build surfaces according to curve and point constraints as well as tolerance settings. The result is returned with the function Surface. Note that you do not have to specify an initial surface at the time of construction. It can be added later or, if none is loaded, a surface will be computed automatically. The class CurveConstraint allows defining curves as constraints to the surface, which you want to build. The class PointConstraint allows defining points as constraints to the surface, which you want to build. The class MakeApprox allows converting a GeomPlate surface into a Geom_BSplineSurface. 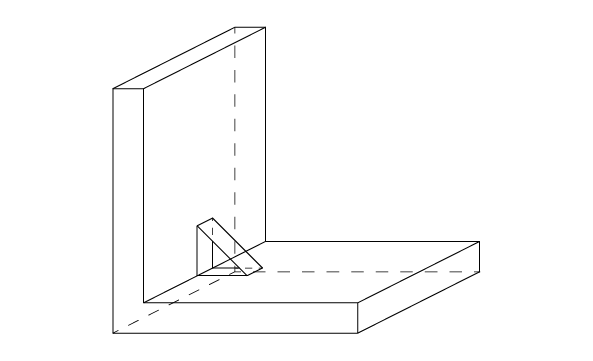 the projection of a 3D curve onto a surface. 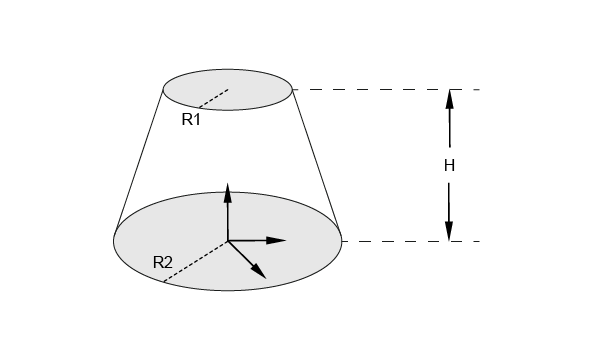 the planar curve transposition from the 3D to the 2D parametric space of an underlying plane and v. s.
the positioning of a 2D gp object in the 3D geometric space. Geom2dAPI_ProjectPointOnCurve allows calculation of all normals projected from a point (gp_Pnt2d) onto a geometric curve (Geom2d_Curve). The calculation may be restricted to a given domain. The curve does not have to be a Geom2d_TrimmedCurve. The algorithm will function with any class inheriting Geom2d_Curve. Having thus created the Geom2dAPI_ProjectPointOnCurve object, we can now interrogate it. Some operators have been redefined to find the closest solution. Standard_Real() returns the minimum distance from the point to the curve. Standard_Integer() returns the number of solutions. gp_Pnt2d() returns the nearest solution point. However, note that in this second case no intermediate Geom2dAPI_ProjectPointOnCurve object is created, and thus it is impossible to have access to other solution points. Having thus created the GeomAPI_ProjectPointOnCurve object, you can now interrogate it. Some operators have been redefined to find the nearest solution. In the second case, however, no intermediate GeomAPI_ProjectPointOnCurve object is created, and it is impossible to access other solutions points. The class GeomAPI_ProjectPointOnSurf allows calculation of all normals projected from a point from gp_Pnt onto a geometric surface from Geom_Surface. Note that the surface does not have to be of Geom_RectangularTrimmedSurface type. The algorithm will function with any class inheriting Geom_Surface. Having thus created the GeomAPI_ProjectPointOnSurf object, you can interrogate it. Some operators have been redefined to help you find the nearest solution. Standard_Real() returns the minimum distance from the point to the surface. In the second case, however, no intermediate GeomAPI_ProjectPointOnSurf object is created, and it is impossible to access other solution points. build a 3d curve from a Geom2d_Curve and a gp_Pln plane. Get the normal direction for the face. BOPAlgo_Tools::EdgesToWires allows creating planar wires from edges. The input edges may be not shared, but the output wires will be sharing the coinciding vertices and edges. For this the intersection of the edges is performed. Although, it is possible to skip the intersection stage (if the input edges are already shared) by passing the corresponding flag into the method. The input edges are expected to be planar, but the method does not check it. Thus, if the input edges are not planar, the output wires will also be not planar. In general, the output wires are non-manifold and may contain free vertices, as well as multi-connected vertices. IntTools_Tools::ClassifyPointByFace classifies point relatively face. BOPTools_AlgoTools::OrientFacesOnShell correctly orients faces on the shell. BOPTools_AlgoTools::MakeSplitEdge splits the edge by the given parameters. BOPTools_AlgoTools::AttachExistingPCurve takes PCurve on the face from one edge and attach this PCurve to other edge coinciding with the first one. BOPTools_AlgoTools::CorrectShapeTolerances and BOPTools_AlgoTools::CorrectTolerances allow correcting the tolerances of the sub-shapes. BRepLib::FindValidRange finds a range of 3d curve of the edge not covered by tolerance spheres of vertices. BOPTools_AlgoTools3D::PointInFace allows getting a point inside the face. BOPTools_AlgoTools3D::GetApproxNormalToFaceOnEdge computes the normal direction for the face in the point located near the edge of the face. The class provides a casting method to obtain the result automatically with a function-like call. Let us use the class BRepBuilderAPI_MakeEdge to create a linear edge from two points. This is the simplest way to create edge E from two points P1, P2, but the developer can test for errors when he is not as confident of the data as in the previous example. In this example an intermediary object ME has been introduced. This can be tested for the completion of the function before accessing the result. More information on error handling in the topology programming interface can be found in the next section. BRepBuilderAPI_MakeEdge provides valuable information. For example, when creating an edge from two points, two vertices have to be created from the points. Sometimes you may be interested in getting these vertices quickly without exploring the new edge. Such information can be provided when using a class. The following example shows a function creating an edge and two vertices from two points. The class BRepBuilderAPI_MakeEdge provides two methods Vertex1 and Vertex2, which return two vertices used to create the edge. How can BRepBuilderAPI_MakeEdge be both a function and a class? It can do this because it uses the casting capabilities of C++. The BRepBuilderAPI_MakeEdge class has a method called Edge; in the previous example the line E = ME could have been written. This instruction tells the C++ compiler that there is an implicit casting of a BRepBuilderAPI_MakeEdge into a TopoDS_Edge using the Edge method. It means this method is automatically called when a BRepBuilderAPI_MakeEdge is found where a TopoDS_Edge is required. This feature allows you to provide classes, which have the simplicity of function calls when required and the power of classes when advanced processing is necessary. All the benefits of this approach are explained when describing the topology programming interface classes. The data or arguments of the method are incorrect, i.e. they do not respect the restrictions specified by the methods in its specifications. Typical example: creating a linear edge from two identical points is likely to lead to a zero divide when computing the direction of the line. Something unexpected happened. This situation covers every error not included in the first category. Including: interruption, programming errors in the method or in another method called by the first method, bad specifications of the arguments (i.e. a set of arguments that was not expected to fail). The second situation is supposed to become increasingly exceptional as a system is debugged and it is handled by the exception mechanism. Using exceptions avoids handling error statuses in the call to a method: a very cumbersome style of programming. In the first situation, an exception is also supposed to be raised because the calling method should have verified the arguments and if it did not do so, there is a bug. For example, if before calling MakeEdge you are not sure that the two points are non-identical, this situation must be tested. Making those validity checks on the arguments can be tedious to program and frustrating as you have probably correctly surmised that the method will perform the test twice. It does not trust you. As the test involves a great deal of computation, performing it twice is also time-consuming. To help the user, the Topology API classes only raise the exception StdFail_NotDone. Any other exception means that something happened which was unforeseen in the design of this API. The NotDone exception is only raised when the user tries to access the result of the computation and the original data is corrupted. At the construction of the class instance, if the algorithm cannot be completed, the internal flag NotDone is set. This flag can be tested and in some situations a more complete description of the error can be queried. If the user ignores the NotDone status and tries to access the result, an exception is raised. Some algorithms also support the history for Solids. The History is filled basing on the result of the operation. History cannot return any shapes not contained in the result. If the result of the operation is an empty shape, all input shapes will be considered as Deleted and none will have Modified and Generated shapes. 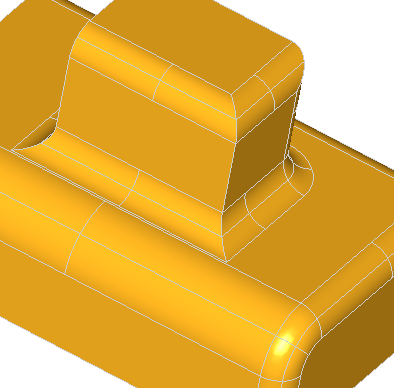 const TopTools_ListOfShape& Generated(const TopoDS_Shape& theS) - to get the shapes Generated from the given shape. The result shape does not contain any of the splits of the shape. For example, in the CUT operation between two intersecting solids all vertices/edges/faces located completely inside the Tool solid will be Deleted during the operation. The shape is considered as Modified during the operation if the result shape contains the splits of the shape, not the shape itself. The shape can be modified only into the shapes with the same dimension. 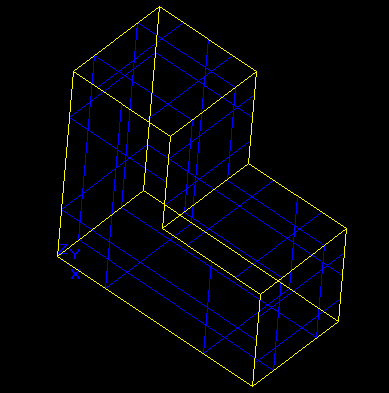 The splits of the shape contained in the result shape are Modified from the shape. The Modified shapes are created from the sub-shapes of the input shapes and, generally, repeat their geometry. The list of Modified elements will contain only those contributing to the result of the operation. If the list is empty, the shape has not been modified and it is necessary to check if it has been Deleted. For example, after translation of the shape in any direction all its sub-shapes will be modified into their translated copies. 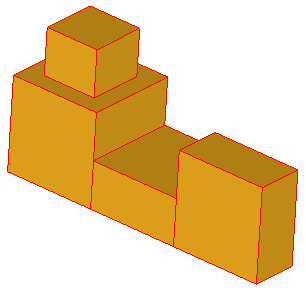 The shapes contained in the result shape are considered as Generated from the input shape if they were produced during the operation and have a different dimension from the shapes from which they were created. The list of Generated elements will contain only those included in the result of the operation. If the list is empty, no new shapes have been Generated from the shape. 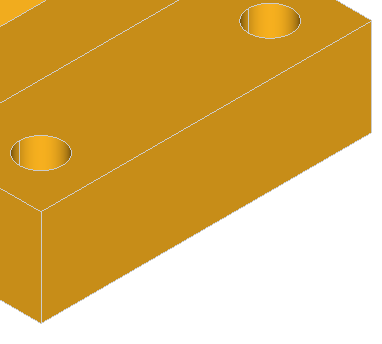 For example, extrusion of the edge in some direction will create a face. This face will be generated from the edge. BRepTools_History is the general History tool intended for unification of the histories of different algorithms. The possibilities of Merging histories and history creation from the API algorithms allow providing easy History support for the new algorithms. For more information on the Draw History mechanism, refer to the corresponding chapter in the Draw users guide - History commands. The deferred class BRepBuilderAPI_MakeShape is the root of all BRepBuilderAPI classes, which build shapes. It inherits from the class BRepBuilderAPI_Command and provides a field to store the constructed shape. The deferred class BRepBuilderAPI_ModifyShape is used as a root for the shape modifications. It inherits BRepBuilderAPI_MakeShape and implements the methods used to trace the history of all sub-shapes. BRepBuilderAPI_MakeVertex creates a new vertex from a 3D point from gp. This class always creates a new vertex and has no other methods. Use BRepBuilderAPI_MakeEdge to create from a curve and vertices. The basic method constructs an edge from a curve, two vertices, and two parameters. where C is the domain of the edge; V1 is the first vertex oriented FORWARD; V2 is the second vertex oriented REVERSED; p1 and p2 are the parameters for the vertices V1 and V2 on the curve. The default tolerance is associated with this edge. Must not be a Null Handle. If the curve is a trimmed curve, the basis curve is used. Can be null shapes. 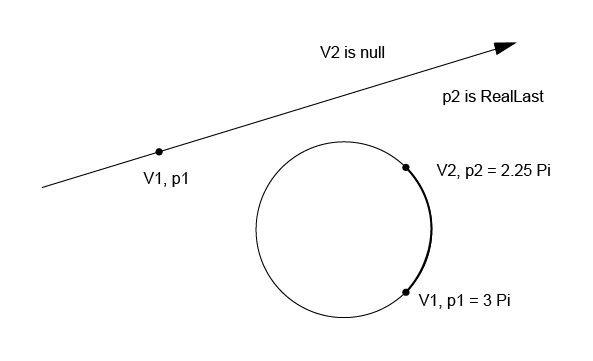 When V1 or V2 is Null the edge is open in the corresponding direction and the corresponding parameter p1 or p2 must be infinite (i.e p1 is RealFirst(), p2 is RealLast()). Must be different vertices if they have different 3d locations and identical vertices if they have the same 3d location (identical vertices are used when the curve is closed). If the parameters are decreasing, the Vertices are switched, i.e. V2 becomes V1 and V1 becomes V2. On a periodic curve the parameters p1 and p2 are adjusted by adding or subtracting the period to obtain p1 in the range of the curve and p2 in the range p1 < p2 <= p1+ Period. So on a parametric curve p2 can be greater than the second parameter, see the figure below. Can be infinite but the corresponding vertex must be Null (see above). The distance between the Vertex 3d location and the point evaluated on the curve with the parameter must be lower than the default precision. The figure below illustrates two special cases, a semi-infinite edge and an edge on a periodic curve. There exist supplementary edge construction methods derived from the basic one. The parameters can be omitted. They are computed by projecting the vertices on the curve. 3d points (Pnt from gp) can be given in place of vertices. Vertices are created from the points. Giving vertices is useful when creating connected vertices. The vertices or points can be omitted if the parameters are given. The points are computed by evaluating the parameters on the curve. The vertices or points and the parameters can be omitted. The first and the last parameters of the curve are used. There are also two methods to construct edges from two vertices or two points. These methods assume that the curve is a line; the vertices or points must have different locations. The class BRepBuilderAPI_MakeEdge can provide extra information and return an error status. If BRepBuilderAPI_MakeEdge is used as a class, it can provide two vertices. This is useful when the vertices were not provided as arguments, for example when the edge was constructed from a curve and parameters. The two methods Vertex1 and Vertex2 return the vertices. Note that the returned vertices can be null if the edge is open in the corresponding direction. EdgeDone – No error occurred, IsDone returns True. PointProjectionFailed – No parameters were given, but the projection of the 3D points on the curve failed. This happens if the point distance to the curve is greater than the precision. 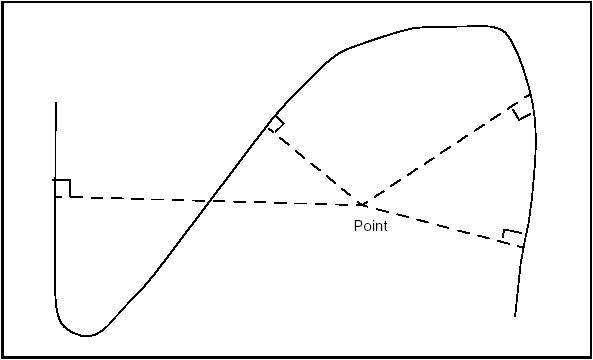 DifferentPointsOnClosedCurve – The two vertices or points have different locations but they are the extremities of a closed curve. PointWithInfiniteParameter – A finite coordinate point was associated with an infinite parameter (see the Precision package for a definition of infinite values). 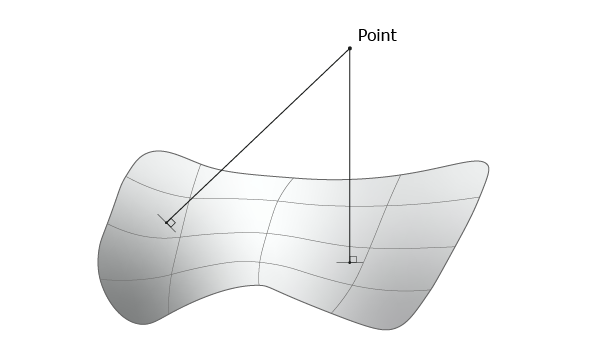 DifferentsPointAndParameter – The distance of the 3D point and the point evaluated on the curve with the parameter is greater than the precision. 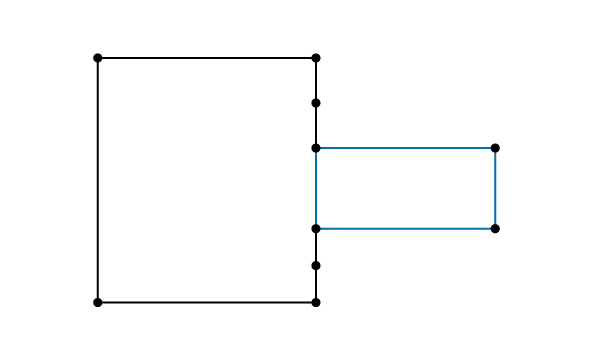 LineThroughIdenticPoints – Two identical points were given to define a line (construction of an edge without curve), gp::Resolution is used to test confusion . The following example creates a rectangle centered on the origin of dimensions H, L with fillets of radius R. The edges and the vertices are stored in the arrays theEdges and theVertices. We use class Array1OfShape (i.e. not arrays of edges or vertices). See the image below. // using the MakeArc function described above. Use BRepBuilderAPI_MakeEdge2d class to make edges on a working plane from 2d curves. The working plane is a default value of the BRepBuilderAPI package (see the Plane methods). BRepBuilderAPI_MakeEdge2d class is strictly similar to BRepBuilderAPI_MakeEdge, but it uses 2D geometry from gp and Geom2d instead of 3D geometry. BRepBuilderAPI_MakePolygon class is used to build polygonal wires from vertices or points. Points are automatically changed to vertices as in BRepBuilderAPI_MakeEdge. The basic usage of BRepBuilderAPI_MakePolygon is to create a wire by adding vertices or points using the Add method. At any moment, the current wire can be extracted. The close method can be used to close the current wire. In the following example, a closed wire is created from an array of points. 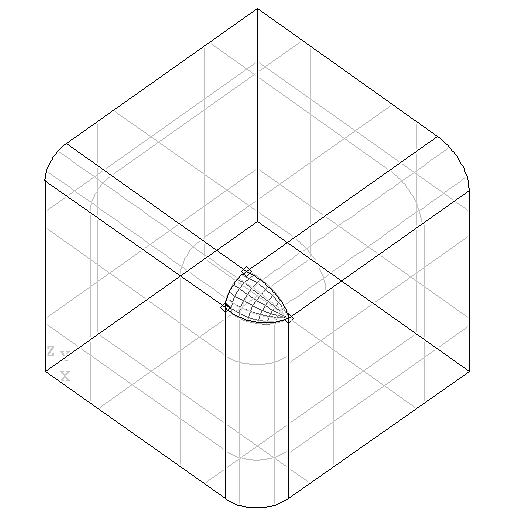 Short-cuts are provided for 2, 3, or 4 points or vertices. Those methods have a Boolean last argument to tell if the polygon is closed. The default value is False. BRepBuilderAPI_MakePolygon class maintains a current wire. The current wire can be extracted at any moment and the construction can proceed to a longer wire. 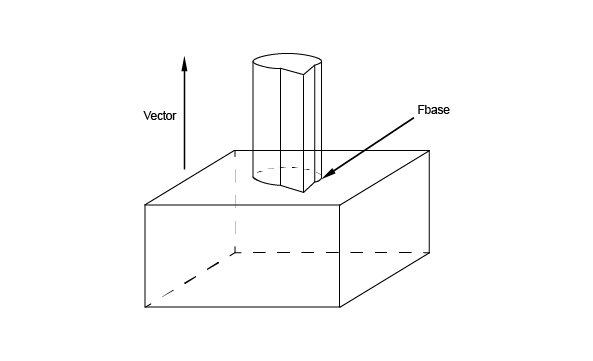 After each point insertion, the class maintains the last created edge and vertex, which are returned by the methods Edge, FirstVertex and LastVertex. When the added point or vertex has the same location as the previous one it is not added to the current wire but the most recently created edge becomes Null. The Added method can be used to test this condition. The MakePolygon class never raises an error. If no vertex has been added, the Wire is Null. If two vertices are at the same location, no edge is created. Use BRepBuilderAPI_MakeFace class to create a face from a surface and wires. An underlying surface is constructed from a surface and optional parametric values. Wires can be added to the surface. A planar surface can be constructed from a wire. An error status can be returned after face construction. A face can be constructed from a surface and four parameters to determine a limitation of the UV space. The parameters are optional, if they are omitted the natural bounds of the surface are used. Up to four edges and vertices are created with a wire. No edge is created when the parameter is infinite. Constraints on the parameters are similar to the constraints in BRepBuilderAPI_MakeEdge. umin,umax (vmin,vmax) must be in the range of the surface and must be increasing. On a U (V) periodic surface umin and umax (vmin,vmax) are adjusted. umin, umax, vmin, vmax can be infinite. There will be no edge in the corresponding direction. 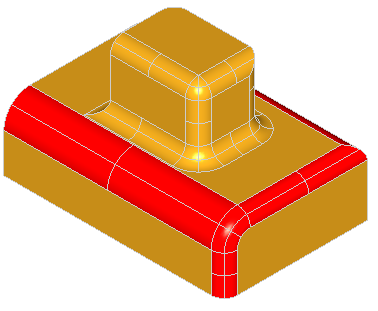 The two basic constructions (from a surface and from a surface and parameters) are implemented for all gp package surfaces, which are transformed in the corresponding Surface from Geom. Once a face has been created, a wire can be added using the Add method. For example, the following code creates a cylindrical surface and adds a wire. More than one wire can be added to a face, provided that they do not cross each other and they define only one area on the surface. (Note that this is not checked). The edges on a Face must have a parametric curve description. If there is no parametric curve for an edge of the wire on the Face it is computed by projection. A planar face can be created from only a wire, provided this wire defines a plane. For example, to create a planar face from a set of points you can use BRepBuilderAPI_MakePolygon and BRepBuilderAPI_MakeFace. To add more than one wire an instance of the BRepBuilderAPI_MakeFace class can be created with the face and the first wire and the new wires inserted with the Add method. The Error method returns an error status, which is a term from the BRepBuilderAPI_FaceError enumeration. FaceDone – no error occurred. NoFace – no initialization of the algorithm; an empty constructor was used. NotPlanar – no surface was given and the wire was not planar. 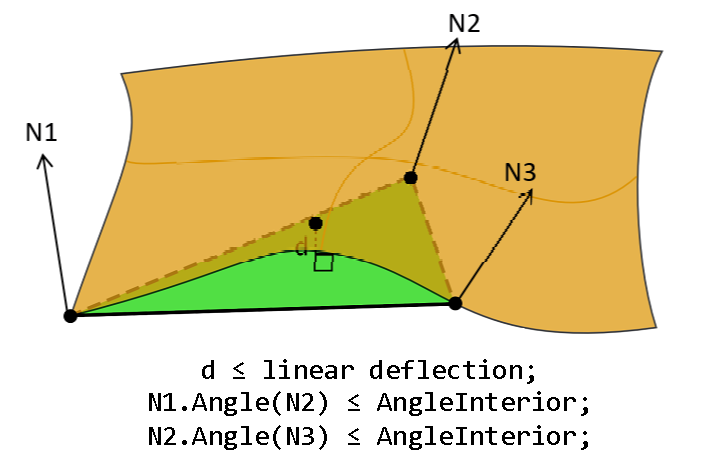 CurveProjectionFailed – no curve was found in the parametric space of the surface for an edge. ParametersOutOfRange – the parameters umin, umax, vmin, vmax are out of the surface. The wire is a composite shape built not from a geometry, but by the assembly of edges. BRepBuilderAPI_MakeWire class can build a wire from one or more edges or connect new edges to an existing wire. For a higher or unknown number of edges the Add method must be used; for example, to build a wire from an array of shapes (to be edges). BRepBuilderAPI_MakeWire class connects the edges to the wire. When a new edge is added if one of its vertices is shared with the wire it is considered as connected to the wire. If there is no shared vertex, the algorithm searches for a vertex of the edge and a vertex of the wire, which are at the same location (the tolerances of the vertices are used to test if they have the same location). If such a pair of vertices is found, the edge is copied with the vertex of the wire in place of the original vertex. All the vertices of the edge can be exchanged for vertices from the wire. If no connection is found the wire is considered to be disconnected. This is an error. BRepBuilderAPI_MakeWire class can return the last edge added to the wire (Edge method). This edge can be different from the original edge if it was copied. The Error method returns a term of the BRepBuilderAPI_WireError enumeration: WireDone – no error occurred. EmptyWire – no initialization of the algorithm, an empty constructor was used. DisconnectedWire – the last added edge was not connected to the wire. NonManifoldWire – the wire with some singularity. The shell is a composite shape built not from a geometry, but by the assembly of faces. Use BRepBuilderAPI_MakeShell class to build a Shell from a set of Faces. What may be important is that each face should have the required continuity. That is why an initial surface is broken up into faces. The solid is a composite shape built not from a geometry, but by the assembly of shells. Use BRepBuilderAPI_MakeSolid class to build a Solid from a set of Shells. Its use is similar to the use of the MakeWire class: shells are added to the solid in the same way that edges are added to the wire in MakeWire. BRepBuilderAPI_Transform class can be used to apply a transformation to a shape (see class gp_Trsf). 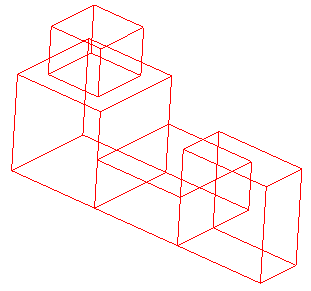 The methods have a boolean argument to copy or share the original shape, as long as the transformation allows (it is only possible for direct isometric transformations). By default, the original shape is shared. The following example deals with the rotation of shapes. It is possible to create partial solids, such as a sphere limited by longitude. 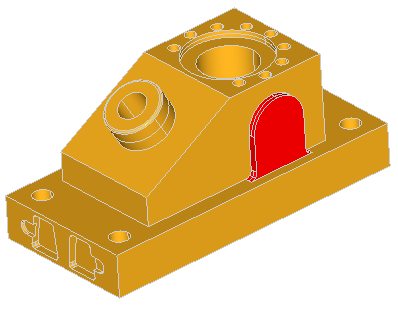 In real models, primitives can be used for easy creation of specific sub-parts. Rotational (through an angle of rotation). It is not allowed to sweep Solids and Composite Solids. 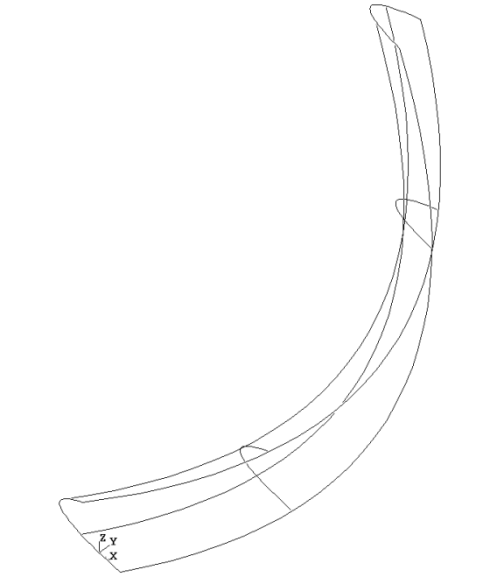 Swept constructions along complex profiles such as BSpline curves also available in the BRepOffsetAPI package. This API provides simple, high level calls for the most common operations. 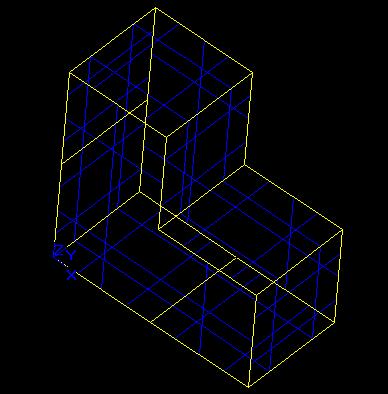 From three dimensions dx, dy and dz. The box is parallel to the axes and extends for [0,dx] [0,dy] [0,dz] . From a point and three dimensions. The same as above but the point is the new origin. From two points, the box is parallel to the axes and extends on the intervals defined by the coordinates of the two points. From a system of axes gp_Ax2 and three dimensions. 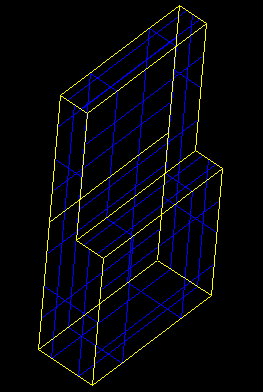 Same as the first way but the box is parallel to the given system of axes. 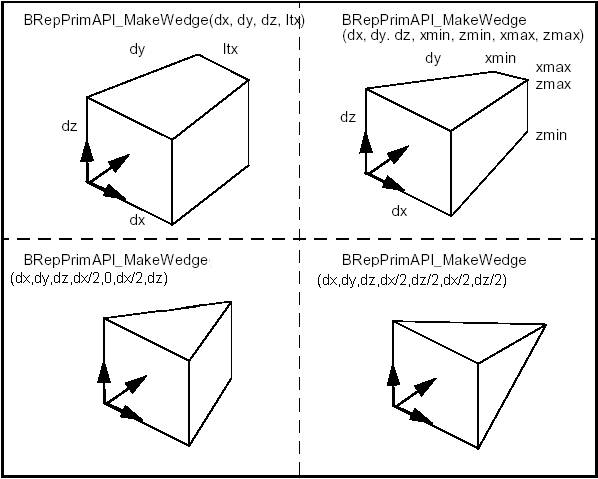 BRepPrimAPI_MakeWedge class allows building a wedge, which is a slanted box, i.e. a box with angles. The wedge is constructed in much the same way as a box i.e. 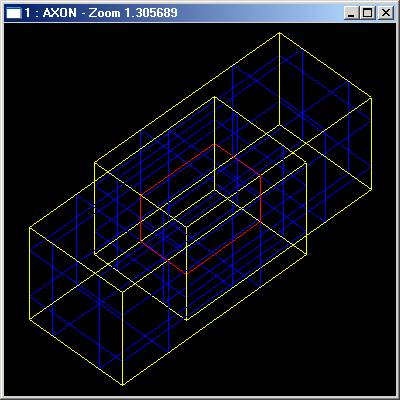 from three dimensions dx,dy,dz plus arguments or from an axis system, three dimensions, and arguments. The following figure shows two ways to build wedges. One is to add a dimension ltx, which is the length in x of the face at dy. The second is to add xmin, xmax, zmin and zmax to describe the face at dy. The first method is a particular case of the second with xmin = 0, xmax = ltx, zmin = 0, zmax = dz. To make a centered pyramid you can use xmin = xmax = dx / 2, zmin = zmax = dz / 2. BRepPrimAPI_MakeOneAxis is a deferred class used as a root class for all classes constructing rotational primitives. Rotational primitives are created by rotating a curve around an axis. They cover the cylinder, the cone, the sphere, the torus, and the revolution, which provides all other curves. A system of coordinates, where the Z axis is the rotation axis..
An angle in the range [0,2*PI]. A vmin, vmax parameter range on the curve. The result of the OneAxis construction is a Solid, a Shell, or a Face. The face is the face covering the rotational surface. Remember that you will not use the OneAxis directly but one of the derived classes, which provide improved constructions. The following figure illustrates the OneAxis arguments. 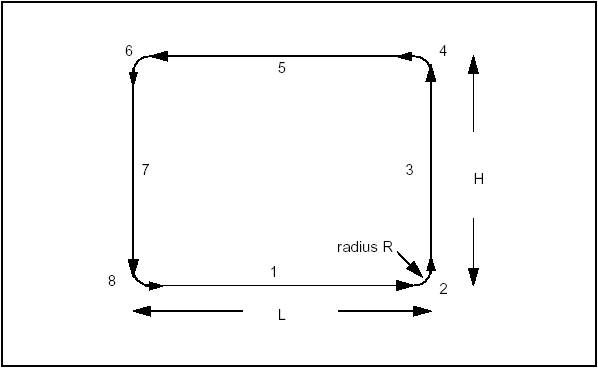 Radius and height, to build a full cylinder. 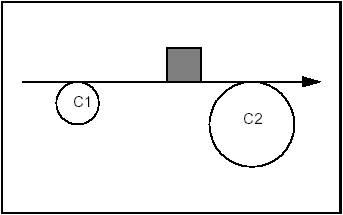 Radius, height and angle to build a portion of a cylinder. The following code builds the cylindrical face of the figure, which is a quarter of cylinder along the Y axis with the origin at X,Y,Z the length of DY and radius R.
Two radii and height, to build a full cone. One of the radii can be null to make a sharp cone. 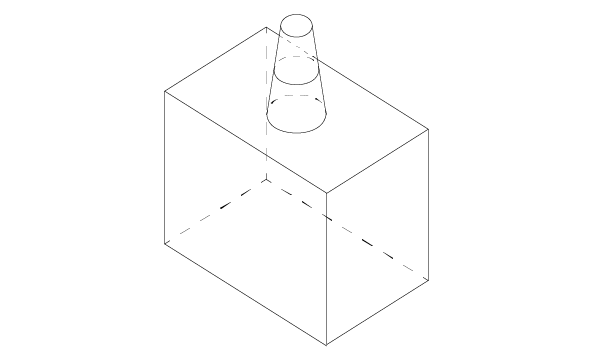 Radii, height and angle to build a truncated cone. The following code builds the solid cone of the figure, which is located in the default system with radii R1 and R2 and height H.
From a radius – builds a full sphere. From a radius and an angle – builds a lune (digon). From a radius and two angles – builds a wraparound spherical segment between two latitudes. The angles a1 and a2 must follow the relation: PI/2 <= a1 < a2 <= PI/2 . 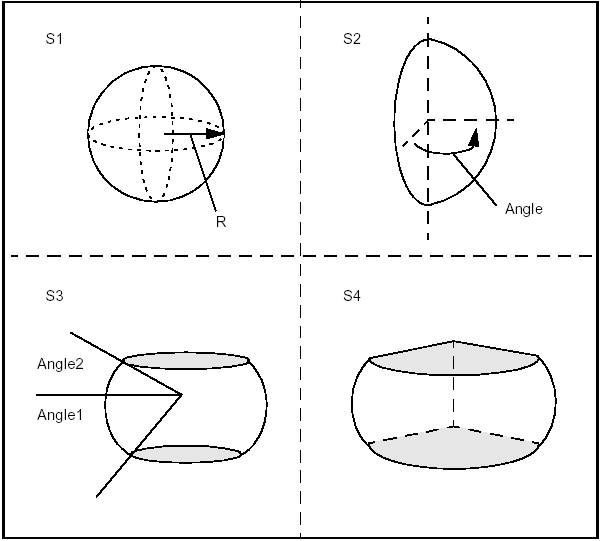 From a radius and three angles – a combination of two previous methods builds a portion of spherical segment. 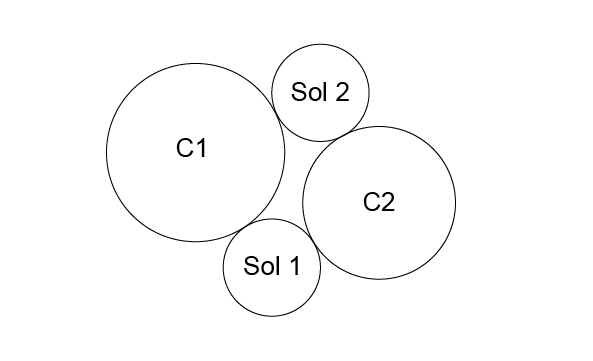 The following code builds four spheres from a radius and three angles. Note that we could equally well choose to create Shells instead of Solids. Two radii – builds a full torus. Two radii and an angle – builds an angular torus segment. Two radii and two angles – builds a wraparound torus segment between two radial planes. The angles a1, a2 must follow the relation 0 < a2 - a1 < 2*PI. Two radii and three angles – a combination of two previous methods builds a portion of torus segment. The following code builds four toroidal shells from two radii and three angles. Note that we could equally well choose to create Solids instead of Shells. BRepPrimAPI_MakeRevolution class allows building a uniaxial primitive from a curve. As other uniaxial primitives it can be created in the default coordinate system or in a given coordinate system. From a curve, use the full curve and make a full rotation. From a curve and an angle of rotation. From a curve and two parameters to trim the curve. The two parameters must be growing and within the curve range. From a curve, two parameters, and an angle. The two parameters must be growing and within the curve range. It is forbidden to sweep Solids and Composite Solids. A Compound generates a Compound with the sweep of all its elements. BRepPrimAPI_MakePipe – produces a general sweep. BRepPrimAPI_MakePrism class allows creating a linear prism from a shape and a vector or a direction. A direction allows creating an infinite or semi-infinite prism. The semi-infinite or infinite prism is toggled by a Boolean argument. All constructors have a boolean argument to copy the original shape or share it (by default). The following code creates a finite, an infinite and a semi-infinite solid using a face, a direction and a length. BRepPrimAPI_MakeRevol class allows creating a rotational sweep from a shape, an axis (gp_Ax1), and an angle. The angle has a default value of 2*PI which means a closed revolution. BRepPrimAPI_MakeRevol constructors have a last argument to copy or share the original shape. The following code creates a a full and a partial rotation using a face, an axis and an angle. Boolean operations are used to create new shapes from the combinations of two groups of shapes. From the viewpoint of Topology these are topological operations followed by blending (putting fillets onto edges created after the topological operation). Topological operations are the most convenient way to create real industrial parts. As most industrial parts consist of several simple elements such as gear wheels, arms, holes, ribs, tubes and pipes. It is usually easy to create those elements separately and then to combine them by Boolean operations in the whole final part. See Boolean Operations for detailed documentation. For arguments having different shape types (e.g. SHELL / SOLID) the type of the resulting shape will be a COMPOUND, containing shapes of the type that is the same as that of the low type of the argument. Example: For SHELL/SOLID the result is a COMPOUND of SHELLs. For arguments with different shape types some of Boolean Operations can not be done using the default implementation, because of a non-manifold type of the result. 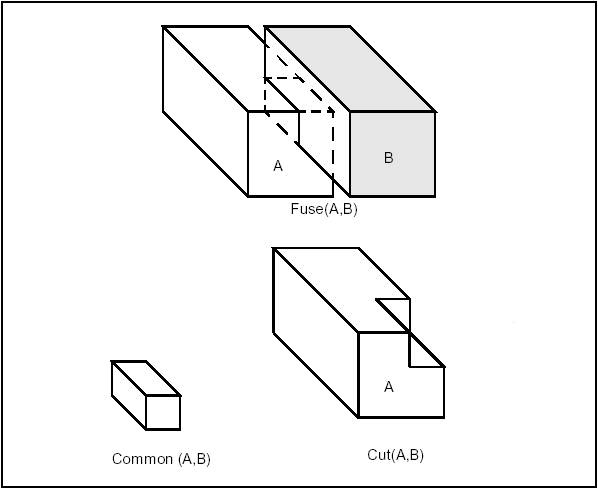 Example: the FUSE operation for SHELL and SOLID can not be done, but the CUT operation can be done, where SHELL is the object and SOLID is the tool. It is possible to perform Boolean Operations on arguments of the COMPOUND shape type. In this case each compound must not be heterogeneous, i.e. 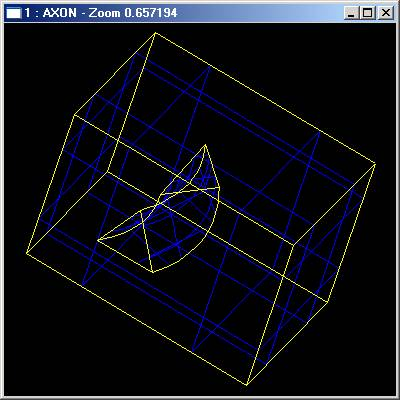 it must contain equidimensional shapes (EDGEs or/and WIREs, FACEs or/and SHELLs, SOLIDs). 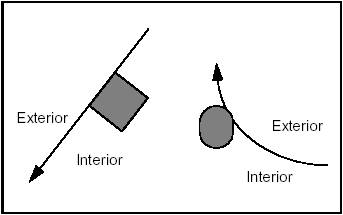 SOLIDs inside the COMPOUND must not contact (intersect or touch) each other. The same condition should be respected for SHELLs or FACEs, WIREs or EDGEs. Boolean Operations for COMPSOLID type of shape are not supported. BRepAlgoAPI_BooleanOperation class is the deferred root class for Boolean operations. BRepAlgoAPI_Fuse performs the Fuse operation. BRepAlgoAPI_Common performs the Common operation. BRepAlgoAPI_Cut performs the Cut operation. BRepAlgoAPI_Section performs the section, described as a TopoDS_Compound made of TopoDS_Edge. Corners and apexes with different concavity. If there is a concavity, both surfaces that need to be extended and those, which do not, are processed. A fillet is a smooth face replacing a sharp edge. BRepFilletAPI_MakeFillet class allows filleting a shape. To produce a fillet, it is necessary to define the filleted shape at the construction of the class and add fillet descriptions using the Add method. 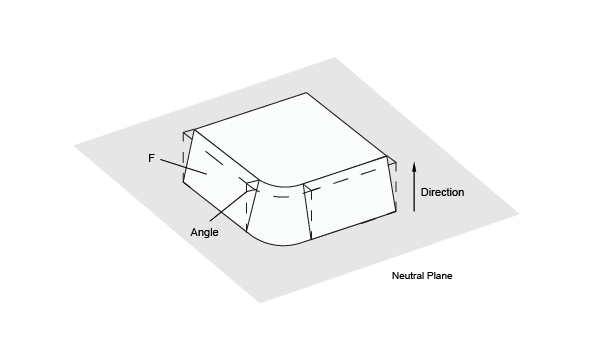 A fillet description contains an edge and a radius. The edge must be shared by two faces. The fillet is automatically extended to all edges in a smooth continuity with the original edge. It is not an error to add a fillet twice, the last description holds. 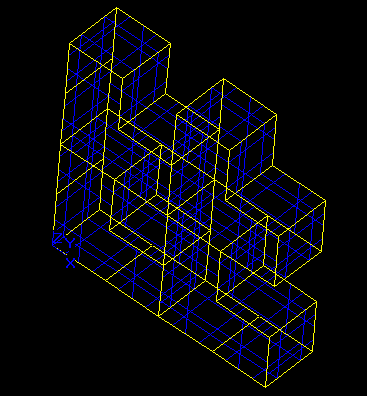 Filleting two edges using radii r1 and r2. 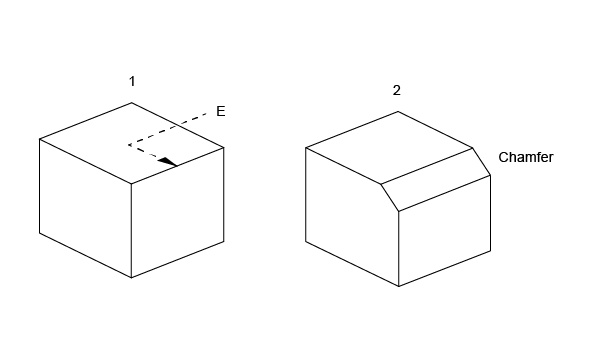 In the following example a filleted box with dimensions a,b,c and radius r is created. 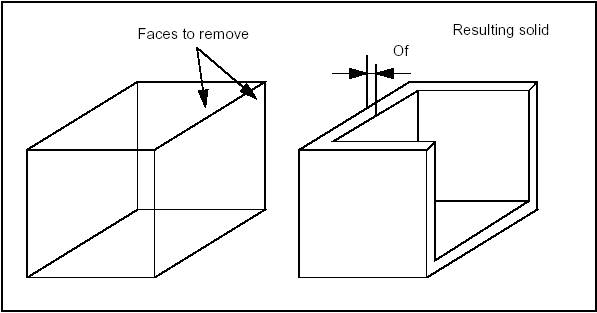 A chamfer is a rectilinear edge replacing a sharp vertex of the face. The surfaces created are ruled and not smooth. The Add syntax for selecting edges requires one or two distances, one edge and one face (contiguous to the edge). Add(d1, d2, E, F) with d1 on the face F.
BRepFilletAPI_MakeFillet2d class allows constructing fillets and chamfers on planar faces. 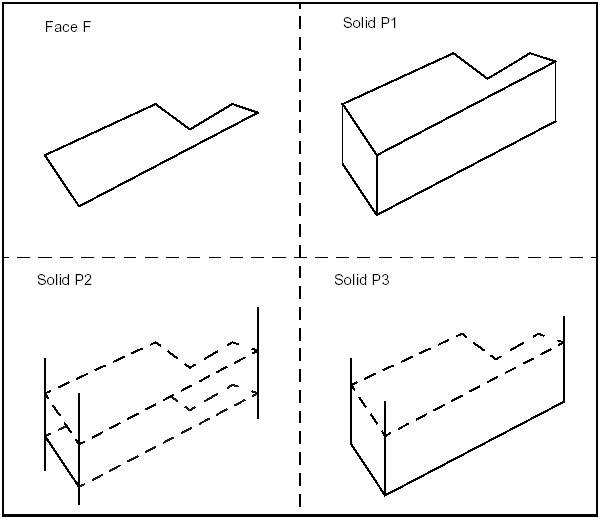 To create a fillet on planar face: define it, indicate, which vertex is to be deleted, and give the fillet radius with AddFillet method. one edge, one vertex, one distance and one angle. Fillets and chamfers are calculated when addition is complete. At the first step, the offsets are computed. After this, the analytical continuations are computed for each offset. Pairwise intersection is computed according to the original topological information (sharing, number of neighbors, etc.). The offset shape is assembled. Each surface is mapped to its geometric offset surface. For each edge, pcurves are mapped to the same pcurves on offset surfaces. 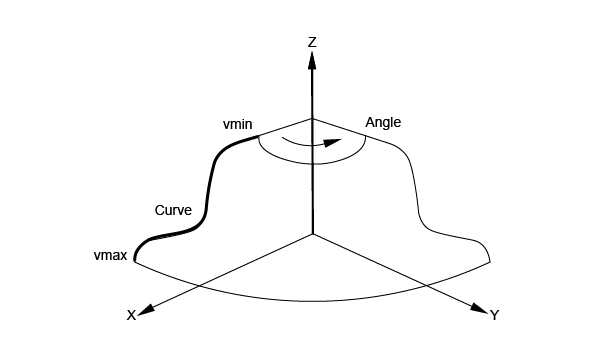 For each edge, 3d curve is constructed by re-approximation of pcurve on the first offset face. Position of each vertex in a result shell is computed as average point of all ends of edges sharing that vertex. 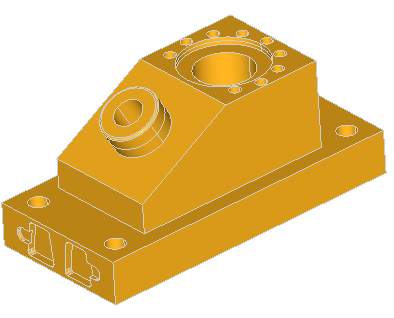 Tolerances are updated according to the resulting geometry. The possible drawback of the simple algorithm is that it leads, in general case, to tolerance increasing. The tolerances have to grow in order to cover the gaps between the neighbor faces in the output. It should be noted that the actual tolerance growth depends on the offset distance and the quality of joints between the input faces. 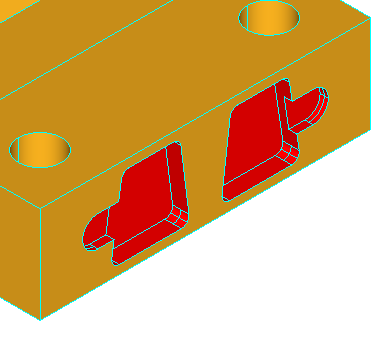 Anyway the good input shell (smooth connections between adjacent faces) will lead to good result. // Computes offset shape using analytical continuation mechanism. // Computes offset shape using simple algorithm. Shelling is used to offset given faces of a solid by a specific value. It rounds or intersects adjacent faces along its edges depending on the convexity of the edge. The MakeThickSolidByJoin method of the BRepOffsetAPI_MakeThickSolid takes the solid, the list of faces to remove and an offset value as input. 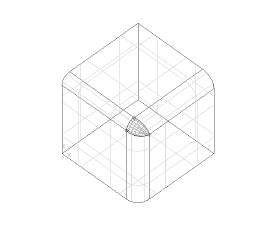 BRepOffsetAPI_DraftAngle class allows modifying a shape by applying draft angles to its planar, cylindrical and conical faces. Neutral plane: intersection between the face and the neutral plane is invariant. BRepOffsetAPI_MakePipe class allows creating a pipe from a Spine, which is a Wire and a Profile which is a Shape. This implementation is limited to spines with smooth transitions, sharp transitions are precessed by BRepOffsetAPI_MakePipeShell. To be more precise the continuity must be G1, which means that the tangent must have the same direction, though not necessarily the same magnitude, at neighboring edges. The angle between the spine and the profile is preserved throughout the pipe. BRepOffsetAPI_MakeEvolved class allows creating an evolved solid from a Spine (planar face or wire) and a profile (wire). The evolved solid is an unlooped sweep generated by the spine and the profile. The evolved solid is created by sweeping the profile’s reference axes on the spine. The origin of the axes moves to the spine, the X axis and the local tangent coincide and the Z axis is normal to the face. The reference axes of the profile are the origin axes. the Z axis is the normal to the plane which contains the spine. 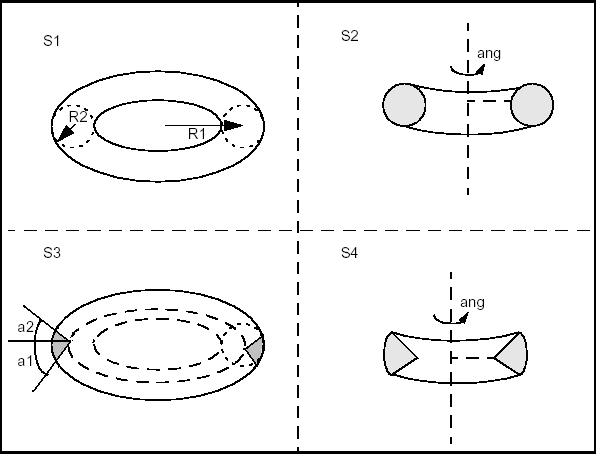 Sewing allows creation of connected topology (shells and wires) from a set of separate topological elements (faces and edges). For example, Sewing can be used to create of shell from a compound of separate faces. It is important to distinguish between sewing and other procedures, which modify the geometry, such as filling holes or gaps, gluing, bending curves and surfaces, etc. Sewing does not change geometrical representation of the shapes. Sewing applies to topological elements (faces, edges) which are not connected but can be connected because they are geometrically coincident : it adds the information about topological connectivity. Already connected elements are left untouched in case of manifold sewing. Shared edges belong to several faces, (i.e. two faces in a manifold topology). Sewn faces should have edges shared with each other. Sewn edges should have vertices shared with each other. 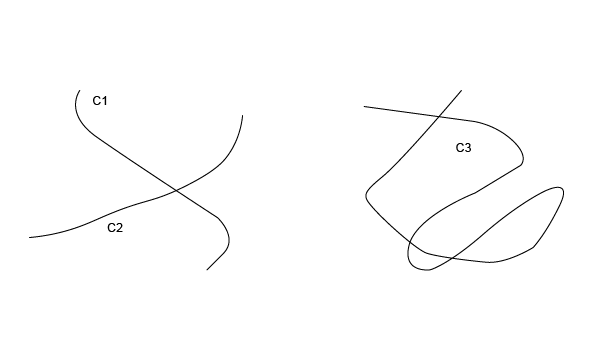 The sewing algorithm is one of the basic algorithms used for shape processing, therefore its quality is very important. sewing of the loaded shapes. Sewing supports working mode with big value tolerance. It is not necessary to repeat sewing step by step while smoothly increasing tolerance. It is also possible to sew edges to wire and to sew locally separate faces and edges from a shape. The Sewing algorithm can be subdivided into several independent stages, some of which can be turned on or off using Boolean or other flags. In brief, the algorithm should find a set of merge candidates for each free boundary, filter them according to certain criteria, and finally merge the found candidates and build the resulting sewn shape. Working tolerance defines the maximal distance between topological elements which can be sewn. It is not ultimate that such elements will be actually sewn as many other criteria are applied to make the final decision. 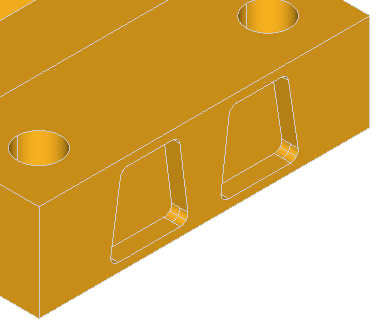 Minimal tolerance defines the size of the smallest element (edge) in the resulting shape. 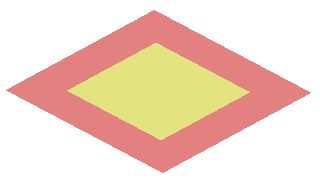 It is declared that no edges with size less than this value are created after sewing. If encountered, such topology becomes degenerated. Non-manifold mode enables sewing of non-manifold topology. If all faces have been sewn correctly, the result is a shell. Otherwise, it is a compound. After a successful sewing operation all faces have a coherent orientation. To produce a closed shell, Sewing allows specifying the value of working tolerance, exceeding the size of small faces belonging to the shape. However, if we produce an open shell, it is possible to get incorrect sewing results if the value of working tolerance is too large (i.e. it exceeds the size of faces lying on an open boundary). Use as small working tolerance as possible. This will reduce the sewing time and, consequently, the number of incorrectly sewn edges for shells with free boundaries. Use as large minimal tolerance as possible. 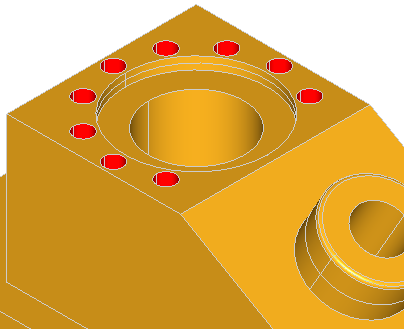 This will reduce the number of small geometry in the shape, both original and appearing after cutting. If it is expected to obtain a shell with holes (free boundaries) as a result of sewing, the working tolerance should be set to a value not greater than the size of the smallest element (edge) or smallest distance between elements of such free boundary. Otherwise the free boundary may be sewn only partially. It should be mentioned that the Sewing algorithm is unable to understand which small (less than working tolerance) free boundary should be kept and which should be sewn. To create one or several shells from a set of faces, sewing merges edges, which belong to different faces or one closed face. Face sewing supports manifold and non manifold modes. 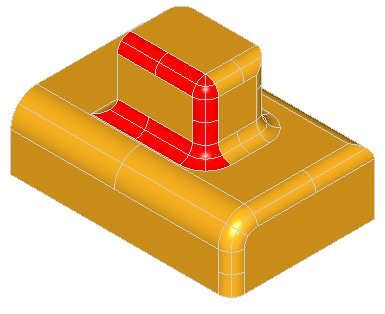 Manifold mode can produce only a manifold shell. Sewing should be used in the non manifold mode to create non manifold shells. Manifold sewing of faces merges only two nearest edges belonging to different faces or one closed face with each other. Non manifold sewing of faces merges all edges at a distance less than the specified tolerance. For a complex topology it is advisable to apply first the manifold sewing and then the non manifold sewing a minimum possible working tolerance. However, this is not necessary for a easy topology. Giving a large tolerance value to non manifold sewing will cause a lot of incorrectness since all nearby geometry will be sewn. If a shape still has some non-sewn faces or edges after sewing, it is possible to use local sewing with a greater tolerance. Local sewing is especially good for open shells. It allows sewing an unwanted hole in one part of the shape and keeping a required hole, which is smaller than the working tolerance specified for the local sewing in the other part of the shape. Local sewing is much faster than sewing on the whole shape. All preexisting connections of the whole shape are kept after local sewing. For example, if you want to sew two open shells having coincided free edges using local sewing, it is necessary to create a compound from two shells then load the full compound using method BRepBuilderAPI_Sewing::Load(). After that it is necessary to add local sub-shapes, which should be sewn using method BRepBuilderAPI_Sewing::Add(). The result of sewing can be obtained using method BRepBuilderAPI_Sewing::SewedShape(). 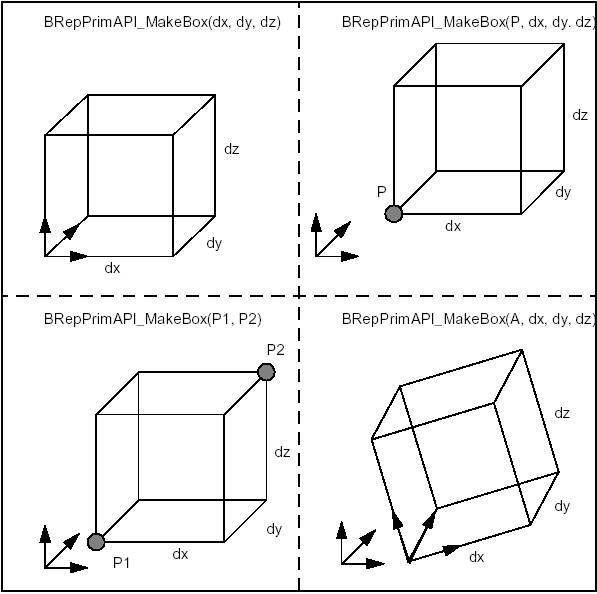 This library contained in BRepFeat package is necessary for creation and manipulation of form and mechanical features that go beyond the classical boundary representation of shapes. In that sense, BRepFeat is an extension of BRepBuilderAPI package. Depending on whether you wish to make a depression or a protrusion, you can choose either to remove matter (Boolean cut: Fuse equal to 0) or to add it (Boolean fusion: Fuse equal to 1). above and/or below a plane. The shape defining the construction of a feature can be either a supporting edge or a concerned area of a face. 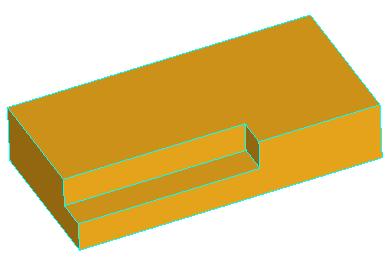 In case of supporting edge, this contour can be attached to a face of the basis shape by binding. When the contour is bound to this face, the information that the contour will slide on the face becomes available to the relevant class methods. In case of the concerned area of a face, you can, for example, cut it out and move it at a different height, which defines the limiting face of a protrusion or depression. Topological definition with local operations of this sort makes calculations simpler and faster than a global operation. The latter would entail a second phase of removing unwanted matter to get the same result. The Form from BRepFeat package is a deferred class used as a root for form features. 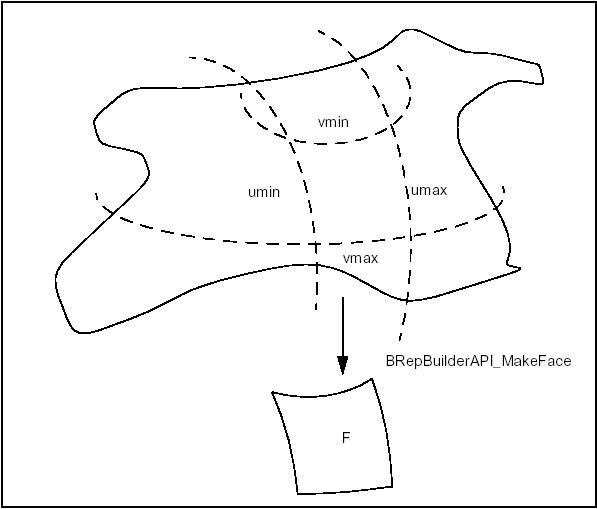 It inherits MakeShape from BRepBuilderAPI and provides implementation of methods keep track of all sub-shapes. another Boolean indicating if the self-intersections have to be found (not used in every case). Perform(Height) The resulting prism is of the given length. Perform(Until) The prism is defined between the position of the base and the given face. Perform(From, Until) The prism is defined between the two faces From and Until. 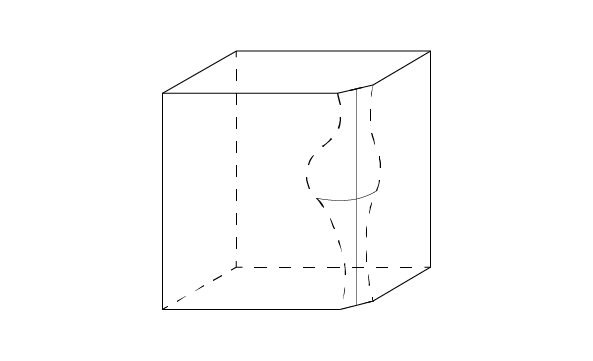 PerformUntilEnd() The prism is semi-infinite, limited by the actual position of the base. PerformFromEnd(Until) The prism is semi-infinite, limited by the face Until. PerformThruAll() The prism is infinite. In the case of a depression, the result is similar to a cut with an infinite prism. In the case of a protrusion, infinite parts are not kept in the result. 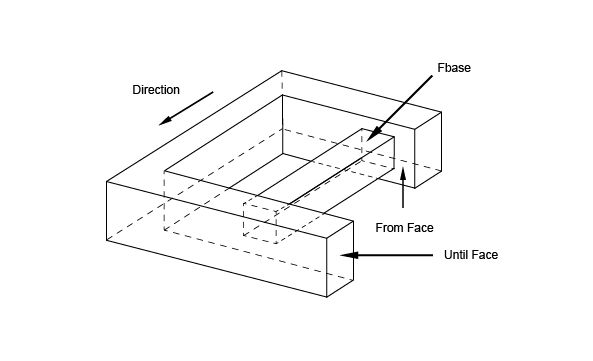 Note that Add method can be used before Perform methods to indicate that a face generated by an edge slides onto a face of the base shape. In the following sequence, a protrusion is performed, i.e. a face of the shape is changed into a prism. another Boolean indicating if self-intersections have to be found (not used in every case). from a limiting face to a height. 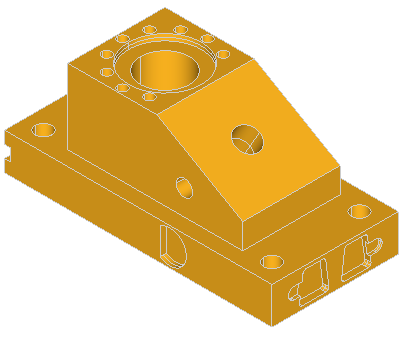 The shape defining construction of the draft prism feature can be either the supporting edge or the concerned area of a face. In case of the supporting edge, this contour can be attached to a face of the basis shape by binding. When the contour is bound to this face, the information that the contour will slide on the face becomes available to the relevant class methods. In case of the concerned area of a face, it is possible to cut it out and move it to a different height, which will define the limiting face of a protrusion or depression direction . The Perform methods are the same as for MakePrism. another boolean indicating whether the self-intersections have to be found (not used in every case). Perform(Angle) The resulting revolution is of the given magnitude. Perform(Until) The revolution is defined between the actual position of the base and the given face. Perform(From, Until) The revolution is defined between the two faces, From and Until. PerformThruAll() The result is similar to Perform(2*PI). In the following sequence, a face is revolved and the revolution is limited by a face of the base shape. Mechanical features include ribs, protrusions and grooves (or slots), depressions along planar (linear) surfaces or revolution surfaces. The semantics of mechanical features is built around giving thickness to a contour. This thickness can either be symmetrical – on one side of the contour – or dissymmetrical – on both sides. As in the semantics of form features, the thickness is defined by construction of shapes in specific contexts. Linear form is implemented in MakeLinearForm class, which creates a rib or a groove along a planar surface. There is one Perform() method, which performs a prism from the wire along the direction1 and direction2 interacting with base shape Sbase. The height of the prism is Magnitude(Direction1)+Magnitude(direction2). The class BRepFeat_Gluer allows gluing two solids along faces. 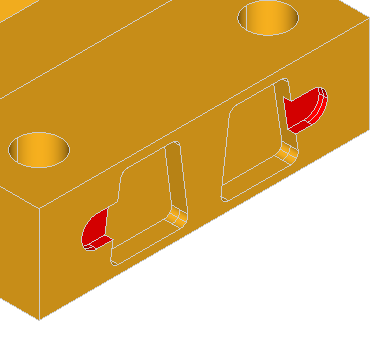 The contact faces of the glued shape must not have parts outside the contact faces of the basic shape. Upon completion the algorithm gives the glued shape with cut out parts of faces inside the shape. The class is created or initialized from two shapes: the “glued” shape and the basic shape (on which the other shape is glued). 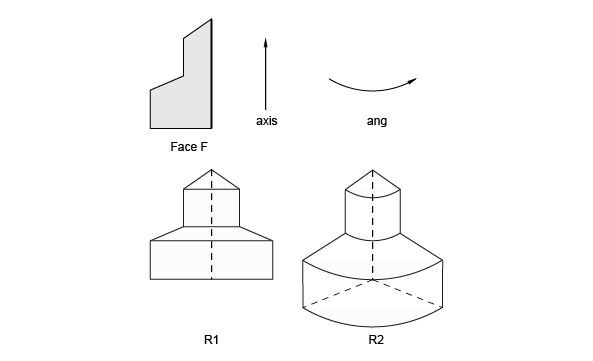 Two Bind methods are used to bind a face of the glued shape to a face of the basic shape and an edge of the glued shape to an edge of the basic shape. Note that every face and edge has to be bounded, if two edges of two glued faces are coincident they must be explicitly bounded. The class BRepFeat_SplitShape is used to split faces of a shape into wires or edges. The shape containing the new entities is rebuilt, sharing the unmodified ones. Add(Wire, Face) – adds a new wire on a face of the basic shape. Add(Edge, Face) – adds a new edge on a face of the basic shape. Add(EdgeNew, EdgeOld) – adds a new edge on an existing one (the old edge must contain the new edge). Note The added wires and edges must define closed wires on faces or wires located between two existing edges. Existing edges must not be intersected. To provide the precision required in industrial design, drawings need to offer the possibility of removing lines, which are hidden in a given projection. For this the Hidden Line Removal component provides two algorithms: HLRBRep_Algo and HLRBRep_PolyAlgo. These algorithms are based on the principle of comparing each edge of the shape to be visualized with each of its faces, and calculating the visible and the hidden parts of each edge. Note that these are not the algorithms used in generating shading, which calculate the visible and hidden parts of each face in a shape to be visualized by comparing each face in the shape with every other face in the same shape. These algorithms operate on a shape and remove or indicate edges hidden by faces. For a given projection, they calculate a set of lines characteristic of the object being represented. They are also used in conjunction with extraction utilities, which reconstruct a new, simplified shape from a selection of the results of the calculation. This new shape is made up of edges, which represent the shape visualized in the projection. HLRBRep_Algo allows working with the shape itself, whereas HLRBRep_PolyAlgo works with a polyhedral simplification of the shape. When you use HLRBRep_Algo, you obtain an exact result, whereas, when you use HLRBRep_PolyAlgo, you reduce the computation time, but obtain polygonal segments. No smoothing algorithm is provided. Consequently, a polyhedron will be treated as such and the algorithms will give the results in form of line segments conforming to the mathematical definition of the polyhedron. This is always the case with HLRBRep_PolyAlgo. HLRBRep_Algo and HLRBRep_PolyAlgo can deal with any kind of object, for example, assemblies of volumes, surfaces, and lines, as long as there are no unfinished objects or points within it. Infinite faces or lines are not processed. To pass a TopoDS_Shape to an HLRBRep_Algo object, use HLRBRep_Algo::Add. With an HLRBRep_PolyAlgo object, use HLRBRep_PolyAlgo::Load. If you wish to add several shapes, use Add or Load as often as necessary. HLRBRep_Algo::Projector and HLRBRep_PolyAlgo::Projector set a projector object which defines the parameters of the view. This object is an HLRAlgo_Projector. HLRBRep_PolyAlgo::Update launches the calculation of outlines of the shape visualized by the HLRBRep_PolyAlgo framework. In the case of HLRBRep_Algo, use HLRBRep_Algo::Update. With this algorithm, you must also call the method HLRBRep_Algo::Hide to calculate visible and hidden lines of the shape to be visualized. With an HLRBRep_PolyAlgo object, visible and hidden lines are computed by HLRBRep_PolyHLRToShape. To perform extraction on an HLRBRep_PolyHLRToShape object, use HLRBRep_PolyHLRToShape::Update function. In addition to support of exact geometrical representation of 3D objects Open CASCADE Technology provides functionality to work with tessellated representations of objects in form of meshes. data structures and algorithms to build surface triangular mesh from BRep objects (shapes). tools to extend 3D visualization capabilities of Open CASCADE Technology with displaying meshes along with associated pre- and post-processor data. VRML converter translates Open CASCADE shapes to VRML 1.0 files (Virtual Reality Modeling Language). Open CASCADE shapes may be translated in two representations: shaded or wireframe. A shaded representation present shapes as sets of triangles computed by a mesh algorithm while a wireframe representation present shapes as sets of curves. 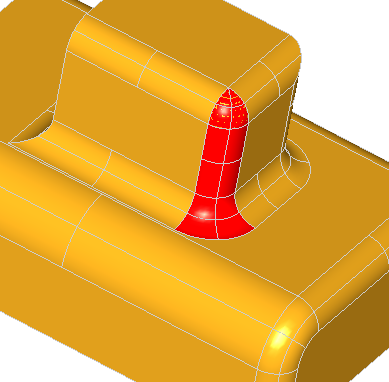 STL converter translates Open CASCADE shapes to STL files. STL (STtereoLithography) format is widely used for rapid prototyping. Besides, we can efficiently help you in the fields of surface and volume meshing algorithms, mesh optimization algorithms etc. If you require a qualified advice about meshing algorithms, do not hesitate to benefit from the expertise of our team in that domain. The projects dealing with numerical simulation can benefit from using SALOME - an Open Source Framework for CAE with CAD data interfaces, generic Pre- and Post- F.E. processors and API for integrating F.E. solvers. The algorithm of shape triangulation is provided by the functionality of BRepMesh_IncrementalMesh class, which adds a triangulation of the shape to its topological data structure. This triangulation is used to visualize the shape in shaded mode. The default meshing algorithm BRepMesh_IncrementalMesh has two major options to define triangulation – linear and angular deflections. At the first step all edges from a face are discretized according to the specified parameters. At the second step, the faces are tessellated. Linear deflection limits the distance between a curve and its tessellation, whereas angular deflection limits the angle between subsequent segments in a polyline. 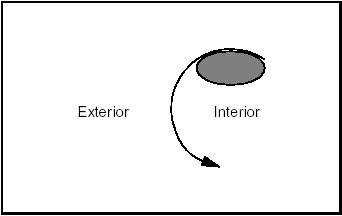 There are additional options to control behavior of the meshing of face interior: DeflectionInterior and AngleInterior. DeflectionInterior limits the distance between triangles and the face interior. AngleInterior (used for tessellation of B-spline faces only) limits the angle between normals (N1, N2 and N3 in the picture) in the nodes of every link of the triangle. There is an exception for the links along the face boundary edges, "Angular Deflection" is used for them during edges discretization. The application should provide deflection parameters to compute a satisfactory mesh. Angular deflection is relatively simple and allows using a default value (12-20 degrees). Linear deflection has an absolute meaning and the application should provide the correct value for its models. Giving small values may result in a too huge mesh (consuming a lot of memory, which results in a long computation time and slow rendering) while big values result in an ugly mesh. For an application working in dimensions known in advance it can be reasonable to use the absolute linear deflection for all models. This provides meshes according to metrics and precision used in the application (for example, it it is known that the model will be stored in meters, 0.004 m is enough for most tasks). However, an application that imports models created in other applications may not use the same deflection for all models. Note that actually this is an abnormal situation and this application is probably just a viewer for CAD models with dimensions varying by an order of magnitude. This problem can be solved by introducing the concept of a relative linear deflection with some LOD (level of detail). The level of detail is a scale factor for absolute deflection, which is applied to model dimensions. Meshing covers a shape with a triangular mesh. 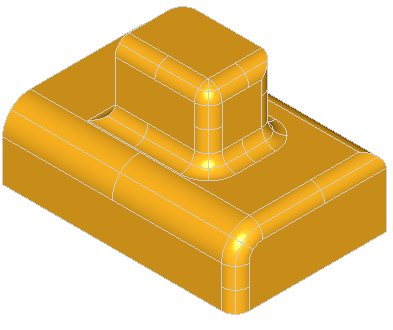 Other than hidden line removal, you can use meshing to transfer the shape to another tool: a manufacturing tool, a shading algorithm, a finite element algorithm, or a collision algorithm. You can obtain information on the shape by first exploring it. To access triangulation of a face in the shape later, use BRepTool::Triangulation. To access a polygon, which is the approximation of an edge of the face, use BRepTool::PolygonOnTriangulation. Implement a new triangulation algorithm replacing the existing functionality that contains overcomplicated solutions that need to be moved to the upper level. In addition, provide the possibility to change the algorithm depending on surface type (initially to speed up meshing of planes). Postprocess discrete model: defines actions specific for the implemented approach to be performed after meshing of faces. By default, this operation stores polygonal data obtained at the previous stage to TopoDS_Edge objects of the source model. The component structure contains two units: IMeshData (see Data model interface) and IMeshTools, defining common interfaces for the data model and algorithmic tools correspondingly. Class IMeshTools_Context represents a connector between these units. The context class caches the data model as well as the tools corresponding to each of six stages of the workflow mentioned above and provides methods to call the corresponding tool safely (designed similarly to IntTools_Context in order to keep consistency with OCCT core tools). All stages, except for the first one, use the data model as input and perform a specific action on the entire structure. Thus, API class IMeshTools_ModelAlgo is defined in order to unify the interface of tools manipulating the data model. Each tool supposed to process the data model should inherit this interface enabling the possibility to cache it in context. In contrast to others, the model builder interface is defined by another class IMeshTools_ModelBuilder due to a different meaning of the stage. The entry point starting the entire workflow is represented by IMeshTools_MeshBuilder. The default implementation of IMeshTools_Context is given in BRepMesh_Context class initializing the context by instances of default algorithmic tools. The factory interface IMeshTools_MeshAlgoFactory gives the possibility to change the triangulation algorithm for a specific surface. 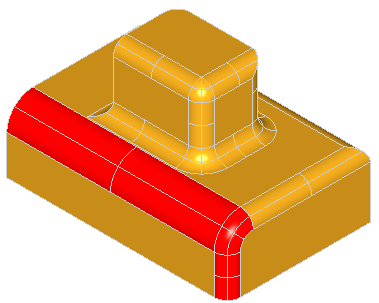 The factory returns an instance of the triangulation algorithm via IMeshTools_MeshAlgo interface depending on the type of surface passed as parameter. It is supposed to be used at the face discretization stage. The default implementation of AlgoFactory is given in BRepMesh_MeshAlgoFactory returning algorithms of different complexity chosen according to the passed surface type. In its turn, it is used as the initializer of BRepMesh_FaceDiscret algorithm representing the starter of face discretization stage. IMeshTools_ShapeVisitor: provides a common interface for operations on edges and faces of the target topological shape. It can be used in couple with IMeshTools_ShapeExplorer. The default implementation available in BRepMesh_ShapeVisitor performs initialization of the data model. The advantage of such approach is that the implementation of IMeshTools_ShapeVisitor can be changed according to the specific data model whereas the shape explorer implementation remains the same. The data structures intended to keep discrete and temporary data required by underlying algorithms are created at the first stage of the meshing procedure. Generally, the model represents dependencies between entities of the source topological shape suitable for the target task. Unit IMeshData provides common interfaces specifying the data model API used on different stages of the entire workflow. Dependencies and references of the designed interfaces are given in the figure below. A specific interface implementation depends on the target application which allows the developer to implement different models and use custom low-level data structures, e.g. different collections, either NCollection or STL. IMeshData_Shape is used as the base class for all data structures and tools keeping the topological shape in order to avoid possible copy-paste. The default implementation of interfaces is given in BRepMeshData unit. The main aim of the default data model is to provide features performing discretization of edges in a parallel mode. Thus, curve, pcurve and other classes are based on STL containers and smart-pointers as far as NCollection does not provide thread-safety for some cases (e.g. NCollection_Sequence). In addition, it closely reflects topology of the source shape, i.e. 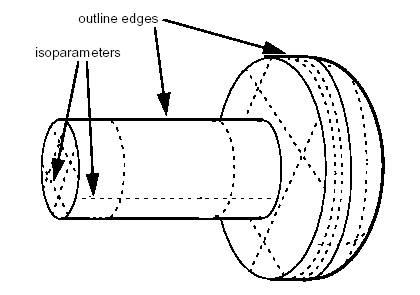 the number of edges in the data model is equal to the number of edges in the source model; each edge contains a set of pcurves associated with its adjacent faces which allows creation of discrete polygons for all pcurves or the 3D curve of a particular edge in a separate thread. Advantages: In case of necessity, the data model (probably with algorithms for its processing) can be easily substituted by another implementation supporting another kind of dependencies between elements. An additional example of a different data model is the case when it is not required to create a mesh with discrete polygons synchronized between adjacent faces, i.e. in case of necessity to speed up creation of a rough per-face tessellation used for visualization or quick computation only (the approach used in XDEDRAW_Props). At this stage the data model is filled by entities according to the topological structure of the source shape. A default implementation of the data model is given in BRepMeshData unit and represents the model as two sets: a set of edges and a set of faces. Each face consists of one or several wires, the first of which always represents the outer wire, while others are internal. In its turn, each wire depicts the ordered sequence of oriented edges. 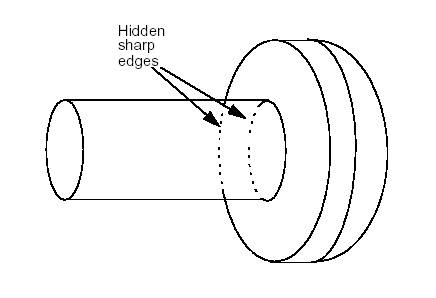 Each edge is characterized by a single 3D curve and zero (in case of free edge) or more 2D curves associated with faces adjacent to this edge. Both 3D and 2D curves represent a set of pairs point-parameter defined in 3D and 2D space of the reference face correspondingly. An additional difference between a curve and a pcurve is that the latter has a reference to the face it is defined for. Model filler algorithm is represented by BRepMesh_ShapeVisitor class creating the model as a reflection to topological shape with help of BRepMesh_ShapeExplorer performing iteration over edges and faces of the target shape. Note that the algorithm operates on a common interface of the data model and creates a structure without any knowledge about the implementation details and underlying data structures. The entry point to collecting functionality is BRepMesh_ModelBuilder class. At this stage only the edges of the data model are considered. Each edge is processed separately (with the possibility to run processing in multiple threads). The edge is checked for existing polygonal data. In case if at least one representation exists and suits the meshing parameters, it is recuperated and used as reference data for tessellation of the whole set of pcurves as well as 3D curve assigned to the edge (see BRepMesh_EdgeTessellationExtractor). Otherwise, a new tessellation algorithm is created and used to generate the initial polygon (see BRepMesh_CurveTessellator) and the edge is marked as outdated. In addition, the model edge is updated by deflection as well as recomputed same range, same parameter and degeneracy parameters. See BRepMesh_EdgeDiscret for implementation details. IMeshData unit defines interface IMeshData_ParametersListArrayAdaptor, which is intended to adapt arbitrary data structures to the NCollection_Array1 container API. This solution is made to use both NCollection_Array1 and IMeshData_Curve as the source for BRepMesh_EdgeParameterProvider tool intended to generate a consistent parametrization taking into account the same parameter property. 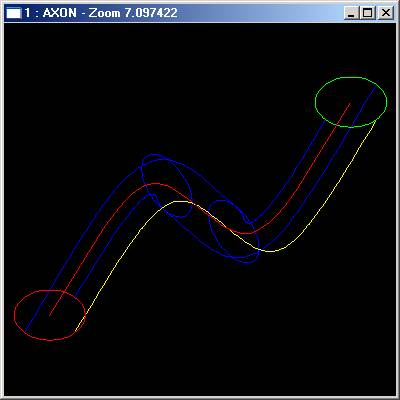 Split target edges by intersection point and synchronize the updated polygon with curve and remaining pcurves associated to each edge. This operation presents a more robust solution comparing to the amplification procedure with a guaranteed result, but it is more difficult for implementation from the point of view of synchronization functionality. This stage implements actions to be performed before meshing of faces. Depending on target goals it can be changed or omitted. By default, BRepMesh_ModelPreProcessor implements the functionality checking topological faces for consistency of existing triangulation, i.e. : consistency with the target deflection parameter; indices of nodes referenced by triangles do not exceed the number of nodes stored in a triangulation. If the face fails some checks, it is cleaned from triangulation and its adjacent edges are cleaned from existing polygons. This does not affect a discrete model and does not require any recomputation as the model keeps tessellations for the whole set of edges despite consistency of their polygons. Discretization of faces is the general part of meshing algorithm. At this stage edges tessellation data obtained and processed on previous steps is used to form contours of target faces and passed as input to the triangulation algorithm. Default implementation is provided by BRepMesh_FaceDiscret class which represents a starter for triangulation algorithm. It iterates over faces available in the data model, creates an instance of the triangulation algorithm according to the type of surface associated with each face via IMeshTools_MeshAlgoFactory and executes it. Each face is processed separately, thus it is possible to process faces in a parallel mode. The class diagram of face discretization is given in the figure below. BRepMesh_DelaunayDeflectionControlMeshAlgo extends functionality of BRepMesh_DelaunayNodeInsertionMeshAlgo by additional procedure controlling deflection of generated triangles. 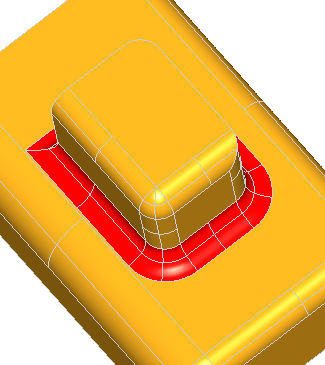 Range splitter tools provide functionality to generate internal surface nodes defined within the range computed using discrete model data. The base functionality is provided by BRepMesh_DefaultRangeSplitter which can be used without modifications in case of planar surface. The default splitter does not generate any internal node. BRepMesh_ConeRangeSplitter, BRepMesh_CylinderRangeSplitter and BRepMesh_SphereRangeSplitter are specializations of the default splitter intended for quick generation of internal nodes for the corresponding type of analytical surface. BRepMesh_UVParamRangeSplitter implements base functionality taking discretization points of face border into account for node generation. Its successors BRepMesh_TorusRangeSplitter and BRepMesh_NURBSRangeSplitter extend the base functionality for toroidal and NURBS surfaces correspondingly. This stage implements actions to be performed after meshing of faces. Depending on target goals it can be changed or omitted. By default, BRepMesh_ModelPostProcessor commits polygonal data stored in the data model to TopoDS_Edge. The Open CASCADE Technology Defeaturing algorithm is intended for removal of the unwanted parts or features from the model. 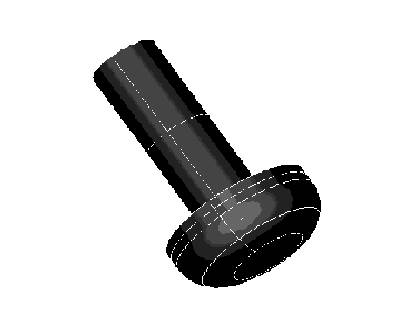 These parts can be holes, protrusions, gaps, chamfers, fillets, etc. Feature detection is not performed, and all features to be removed should be defined by the user. 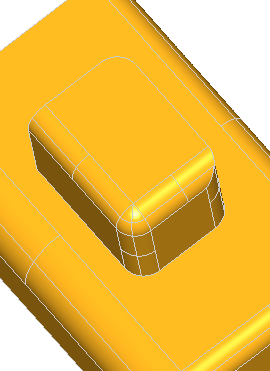 The input shape is not modified during Defeaturing, the new shape is built in the result. On the API level the Defeaturing algorithm is implemented in the BRepAlgoAPI_Defeaturing class. At input the algorithm accepts the shape to remove the features from and the features (one or many) to be removed from the shape. 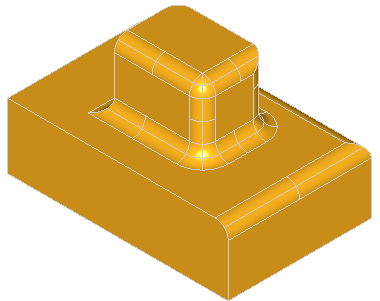 Currently, the input shape should be either SOLID, or COMPSOLID, or COMPOUND of SOLIDs. The features to be removed are defined by the sets of faces forming them. It does not matter how the feature faces are given: as separate faces or their collections. The faces should belong to the initial shape, else they are ignored. The actual features removal is performed by the low-level BOPAlgo_RemoveFeatures algorithm. On the API level, all inputs are passed into the tool and the method BOPAlgo_RemoveFeatures::Perform() is called. 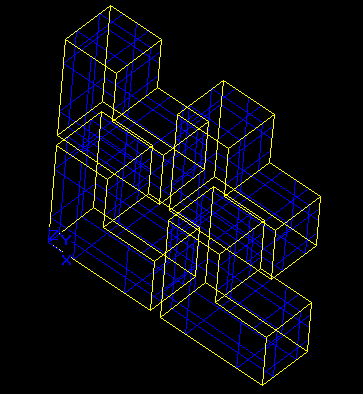 Before removing features, all faces to be removed from the shape are sorted into connected blocks - each block represents a single feature to be removed. The features are removed from the shape one by one, which allows removing all possible features even if there are some problems with their removal (e.g. due to incorrect input data). Rebuild the solids with reconstructed adjacent faces avoiding the feature faces. If the single feature removal was successful, the result shape is overwritten with the new shape, otherwise the results are not kept, and the warning is given. Either way the process continues with the next feature. Note that the other options of the base class are not supported here and will have no effect. 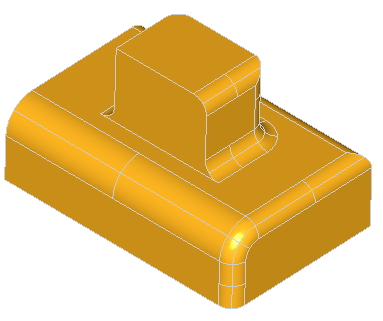 History support allows tracking modification of the input shape in terms of Modified, IsDeleted and Generated. By default, the history is collected, but it is possible to disable it using the method SetToFillHistory(false). On the low-level the history information is collected by the history tool BRepTools_History, which can be accessed through the method BOPAlgo_RemoveFeatures::History(). BOPAlgo_AlertRemoveFeaturesFailed - the error alert is given in case if the operation was aborted by the unknown reason. For more information on the error/warning reporting system, see the chapter Errors and warnings reporting system of Boolean operations user guide. Parallel processing mode - allows running the algorithm in parallel mode obtaining the result faster. 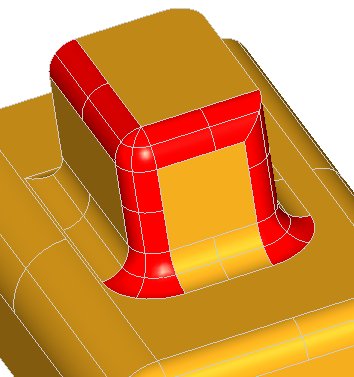 Intersection of the surfaces of the connected faces adjacent to the feature should not be empty. It means, that such faces should not be tangent to each other. If the intersection of the adjacent faces will be empty, the algorithm will be unable to trim the faces correctly and, most likely, the feature will not be removed. The algorithm does not process the INTERNAL parts of the solids, they are simply removed during reconstruction. The command removefeatures allows using the Defeaturing algorithm on the Draw level. The standard history commands can be used to track the history of shape modification during Defeaturing. For more details on commands above, refer to the Defeaturing commands of the Draw test harness user guide. Open CASCADE Technology provides tools for making an arbitrary 3D model (or just shape) periodic in 3D space in the specified directions. Periodicity of the shape means that the shape can be repeated in any periodic direction any number of times without creation of the new geometry or splits. The idea of this algorithm is to make the shape look similarly on the opposite sides or on the period bounds of periodic directions. It does not mean that the opposite sides of the shape will be mirrored. It just means that the opposite sides of the shape should be split by each other and obtain the same geometry on opposite sides. Such approach will allow repeating the shape, i.e. translating the copy of a shape on the period, without creation of new geometry because there will be no coinciding parts of different dimension. As expected, the shape is not split and the repeated elements do not touch. Splits the positive side of the shape by the moved copy, ensuring copying of the geometry from negative side to positive. Repeated copying of the geometry ensures that the corner edges of the periodic shape will have the same geometry on opposite sides of all periodic directions. Thus, in the periodic shape the geometry from positive side of the shape is always copied on the negative side of periodic directions. The algorithm also associates the identical (or twin) shapes located on the opposite sides of the periodic shape. By the construction, the twin shapes should always have the same geometry and distanced from each other on the period. It is possible that the shape does not have any twins. 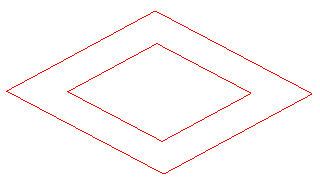 It means that when repeating this shape will not touch the opposite side of the shape. In the example when the periods of the shape are grater than its extensions, non of the sub-shapes has a twin. The algorithm also provides the methods to repeat the periodic shape in periodic directions. To repeat shape the algorithm makes the requested number of copies of the shape and translates them one by one on the time * period value. After all copies are made and translated they are glued to have valid shape. The subsequent repetitions are performed on the repeated shape, thus e.g. repeating the shape two times in any periodic direction will create result containing three shapes (original plus two copies). Single subsequent repetition in any direction will result already in 6 shapes. The repetitions can be cleared and started over. The algorithm supports the history of shapes modifications, thus it is possible to track how the shapes have been changed to make it periodic and what new shapes have been created during repetitions. Both split history and history of periodic shape repetition are available here. Note, that all repeated shapes are stored as generated into the history. BRepTools_History is used for history support. BOPAlgo_AlertUnableToRepeat - Warning alert is given if the gluing of the repeated shapes has failed. For more information on the error/warning reporting system please see the chapter Errors and warnings reporting system of Boolean operations user guide. Parallel processing mode. The other options of the base class are not supported here and will have no effect. For more details on the periodicity commands please refer the Periodicity commands of the Draw test harness user guide. To track the history of a shape modification during MakePeriodic operation the standard history commands can be used. To have possibility to access the error/warning shapes of the operation use the bdrawwarnshapes command before running the algorithm (see command usage in the Errors and warnings reporting system of Boolean operations user guide). Open CASCADE Technology provides tools for making the same-dimensional touching shapes connected (or glued), i.e. for making the coinciding geometries topologically shared among shapes. To make the shapes connected they are glued by the means of General Fuse algorithm. The option BOPAlgo_GlueShift is used, thus if the input shapes have been interfering the algorithm will be unable to recognize this. Making the group of shapes connected can be useful e.g. before meshing the group. It will allow making the resulting mesh conformal. The algorithm for making the shapes connected is implemented in the class BOPAlgo_MakeConnected. In frames of this tool the input shapes are called materials, and each input shape has a unique material. For input EDGES the resulting VERTICES are associated with the input edges. The association process is called the material association. It allows finding the coinciding elements for the opposite input shapes. These elements will be associated to at least two materials (one on the positive side of the shape, the other - on negative). // Returns the original shapes which images contain the given shape with FORWARD orientation. // Returns the original shapes which images contain the given shape with REVERSED orientation. The tool provides possibility to make the connected shape periodic. Since by making the shape periodic it ensures that the geometry of coinciding shapes on the opposite sides will be the same it allows reusing the mesh of the shape for its periodic twins. After making the shape periodic the material associations are updated to correspond to the actual state of the result shape. Repetition of the periodic shape is also possible from here. Material associations are not going to be lost. // Returns the list of original shapes from which the current shape has been created. Both Gluing history and history of making the shape periodic and periodic shape repetition are available here. Note, that all repeated shapes are stored as generated into the history. BOPAlgo_AlertShapeIsNotPeriodic - warning alert is given on the attempt to repeat the shape before making it periodic. For more details on the connexity commands please refer the MakeConnected commands of the Draw test harness user guide. 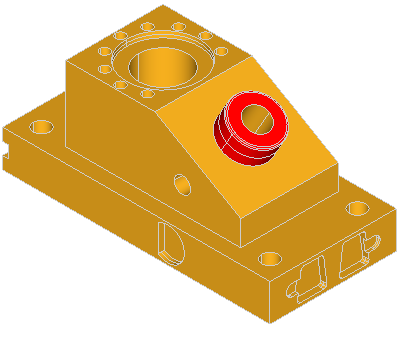 To track the history of a shape modification during MakeConnected operation the standard history commands can be used.